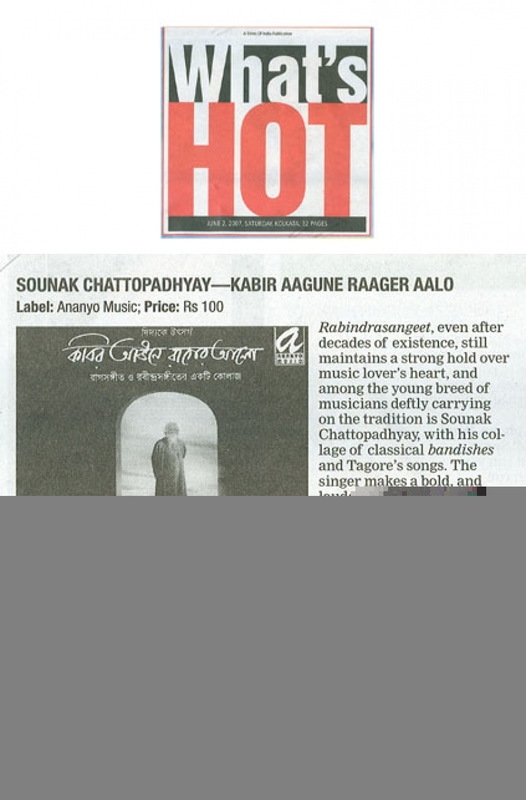 Sounak is a foremost vocalist of the present generation and has made a place for himself in the hearts of many Classical and Bengali Art music lovers. 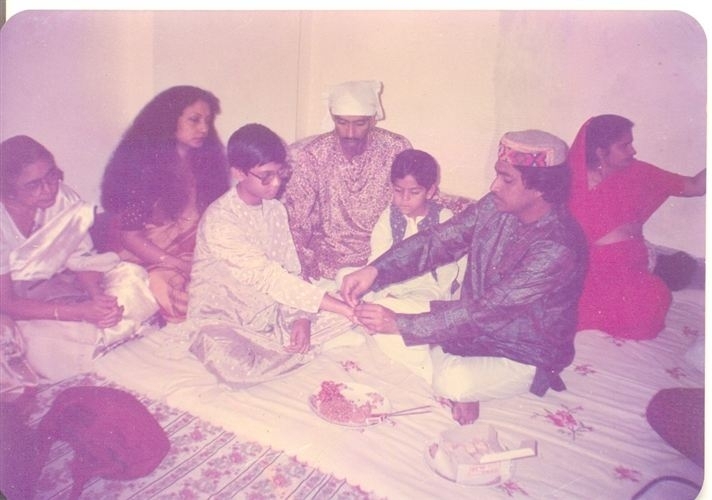 His regular stage performances for prestigious concert stages, in India and abroad, his regular television appearances and his audio albums that have topped charts bear witness to that. 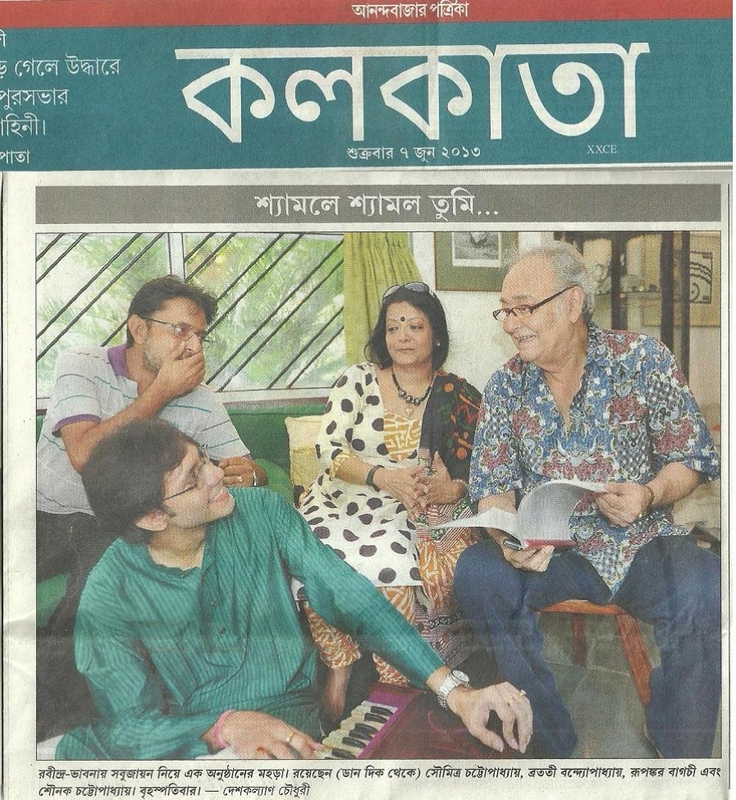 Having an exceptional training base with almost 25 years of experience in learning Hindustani Classical music from Ustad Mashkoor Ali Khansahab and Mubarak Ali Khansahab of the Kirana Gharana, semi classical forms from Smt Sanjukta Ghosh, advanced training in Rabindrasangeet (Swagatalakshmi Dasgupta and Pramita Mallick) and other traditional Bengali songs (Atulprasad, Rajanikanta, D.L.Roy, Nazrulgeeti, Puratoni etc), give him a range of performances that not many of his contemporaries have. 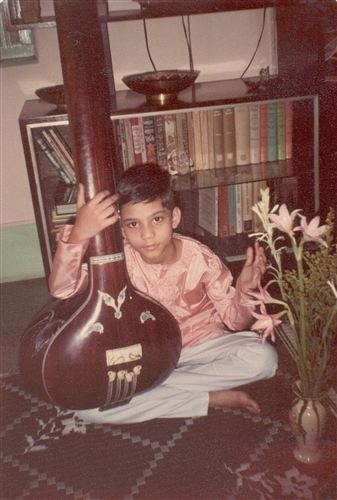 First prize in Dover lane Music Conference talent contest, Swar Prabhat Talent Contest by Salt Lake Cultural Association, Kal Ke Kalakar - Mumbai, National Scholarship from the Govt. 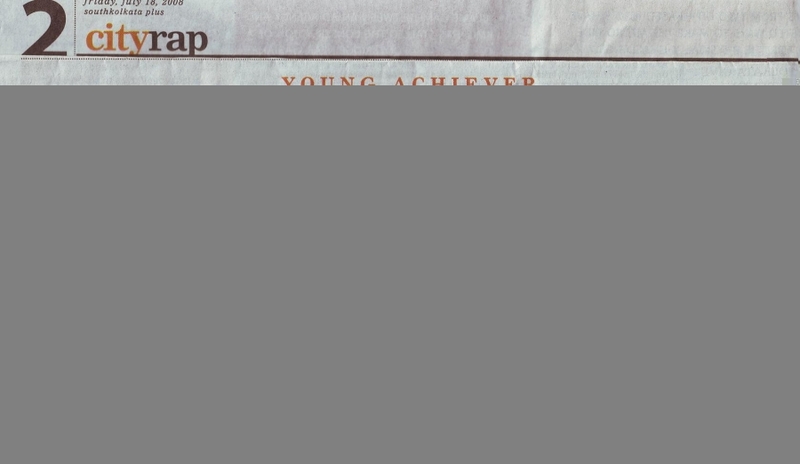 of India, the Gyana Pravaha Scholarship, Shanmukhananda Sangeet Shiromani Award from Mumbai and KKMERS Young Achiever Award, are some of the feathers that Sounak has on his cap. 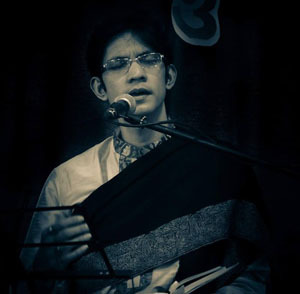 His unique trend setting blending of classical music and other forms of Bengali art music is a treat for the audience and shows his versatility as an artist. 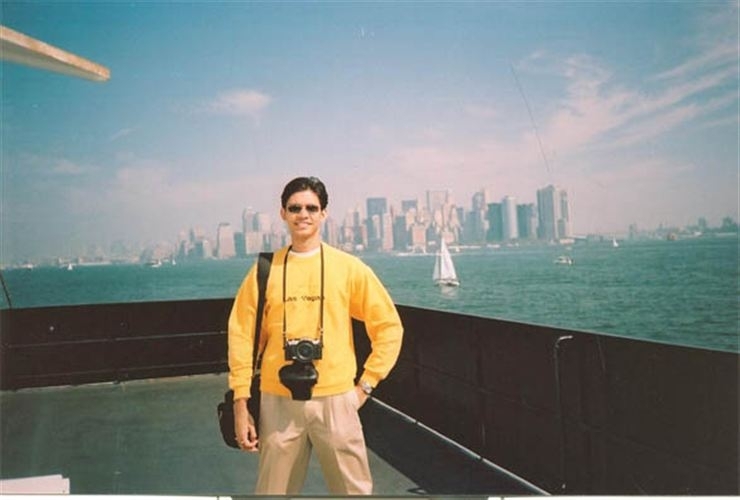 He has performed extensively in cities and venues all over India and the United States, Canada, UK, Australia, Singapore, Indonesia, Oman, Kuwait and Bangladesh. 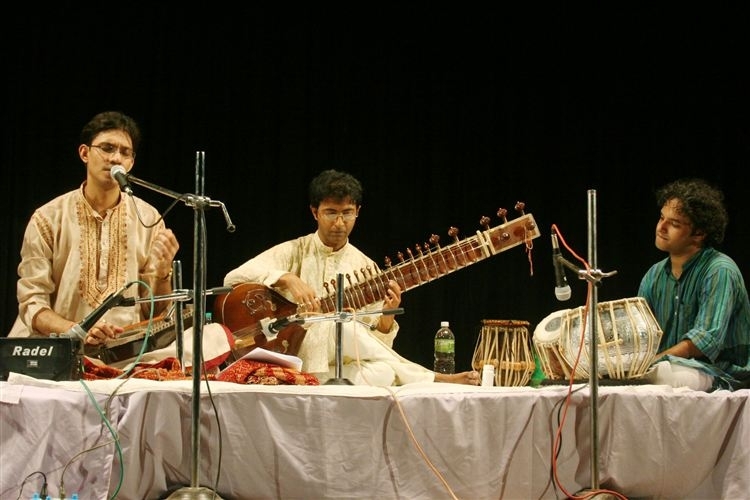 Some of the major concerts include the Dover Lane Music Conference (Kolkata), Uttarpara Sangeet Sammelan, Pt. 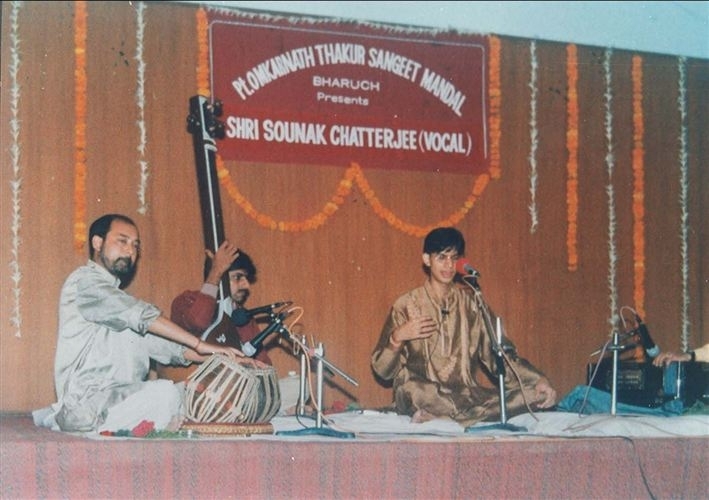 Omkarnath Thakur Sangeet Sammelan(Bharuch), Haridas Swami Sangeet Sammelan(Mumbai), Surdhwani Raga Festival (UK 2005) NABC (USA 2009 and 2015) and Regional Bengali Conference (USA 2010), 150 Years of Tagore CAB – (USA 2011) Art Omi international Music Residency NY - USA(2011)India Festival (Baltimore 2011), to name just a few. Other than traditional stage performances, he has also emerged as a very successful ideator and script writer for composite programmes. These programmes go beyond just musical entertainments and address social and cultural issues from a broader perspective. 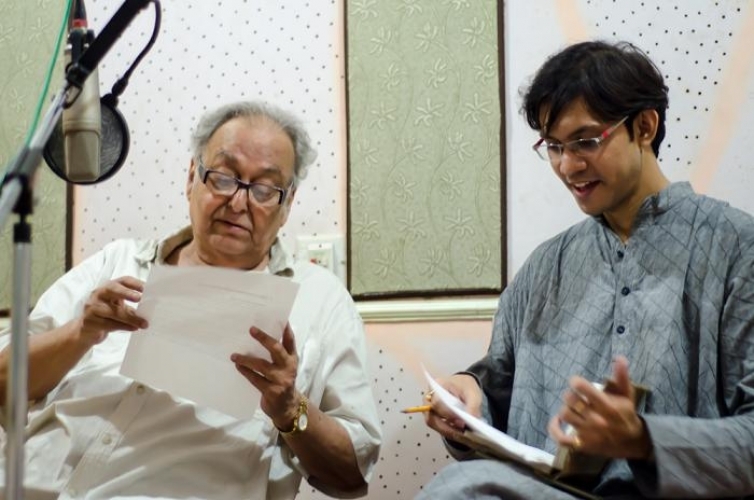 He has worked with personalities like Dhritiman Chaterji, Raima Sen, Rituparna Sengupta, Soumitra Chatterjee, Sankarlal Bhattacharya, Parambrata Chatterjee, Barun Chanda, Bratati Bandyopadhyay, Tanmoy Bose, Purbayan Chatterjee, Subhen Chatterjee, Meeta Vasisht, Usha Uthup, Suman Mukherjee, Sudarshan Chakravorty and Pramita Mallick. 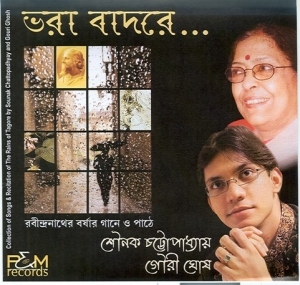 His music albums, published by top brand companies like - Times Music and Asha Audio, have been unique experiments in the field of Rabindrasangeet and have received nominations for best album awards. 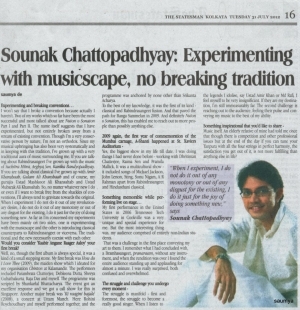 As an artist of the young generation Sounak wants to think beyond the stereotypical and challenge conventions. 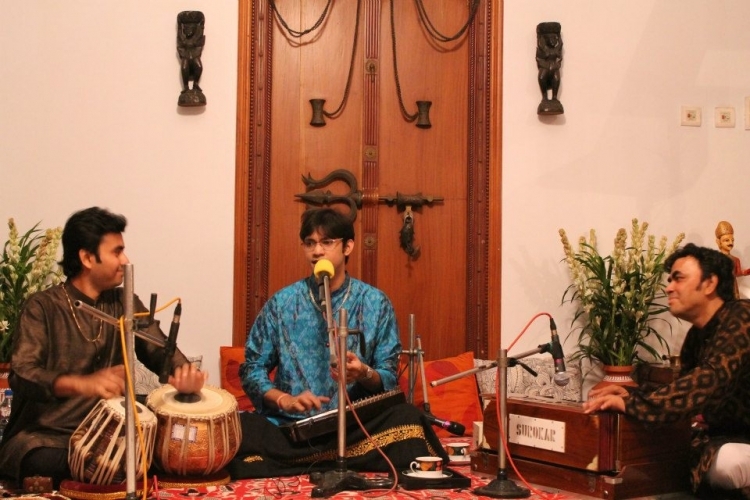 However in doing so, he is never in denial of his roots or the tradition of his Guru Gharanas. He wants to be different and with his academic and musical education, and a sense of responsibility for his art, he is one person who can make a difference to the world of arts today and contribute towards making it accessible to the younger generation. Dwijendralal er Gaan "Aji Nutono Rotone"
1st Prize in Talent Search by The Dover Lane Music Conference. 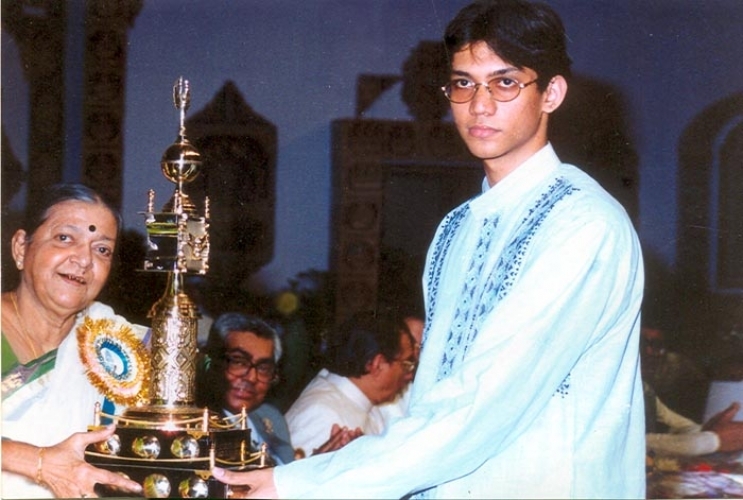 Awarded Ustad Amir Khan Award for The Best Vocalist and The Best Youngest Talent by Newspaper Pratidin, in the same competition (1999). 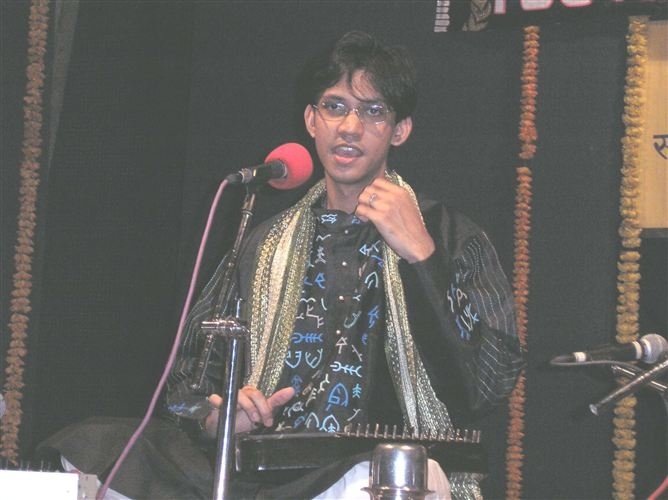 1st Prize and awarded Title Surmani in the famous Kal-Ke-Kalakar music competition organized by Sur Singar Sansad of Mumbai (2004). 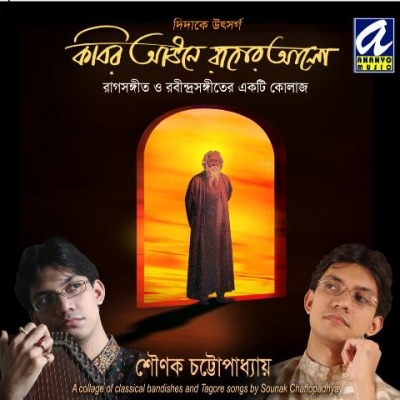 Empanelled as an artist of the ICCR in both Hindustani Vocal (Khayal) and Rabindra Sangeet (Songs of Rabindranath Tagore). 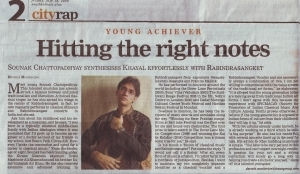 Winner and only recipient of 2006 Gyana Pravaha scholarship for young and promising artists for Khayal. Awarded the KKMERS Award for Excellence in Vocation in December 2016. 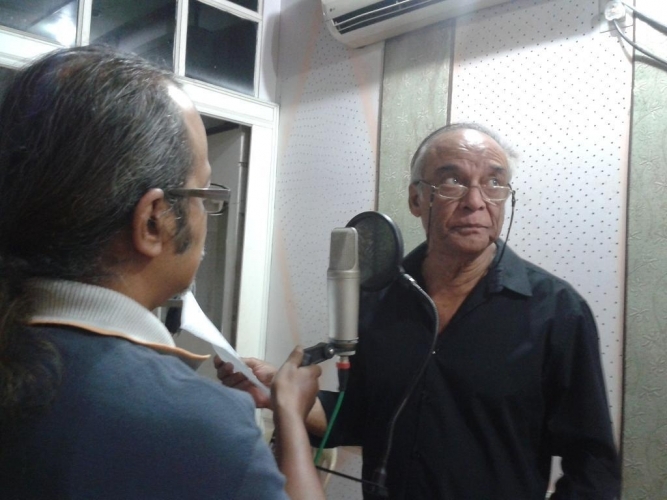 A regular artist of Khayal at the All India Radio – Kolkata. Toured US performing in Florida, Los Angeles, Philadelphia, New Jersey and New York City (USA) – 2007. 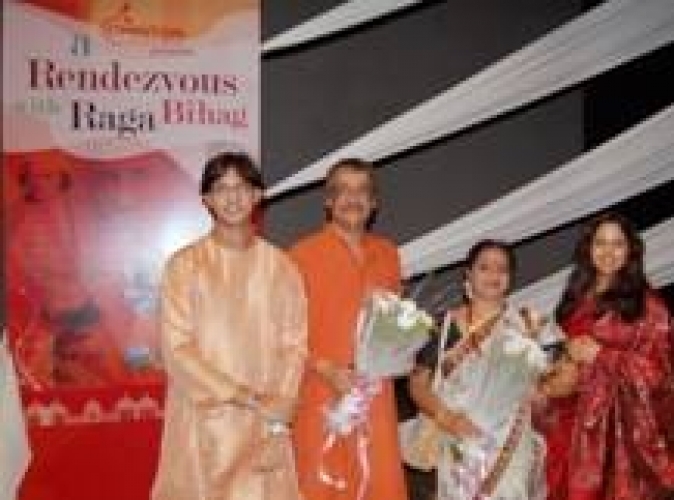 Presented “Ki Ragini Bajale”, an interaction of Ragas and Rabindrasangeet, with Srikanto Acharya and Rohini Roychowdhury in Kolkata in June 2008. 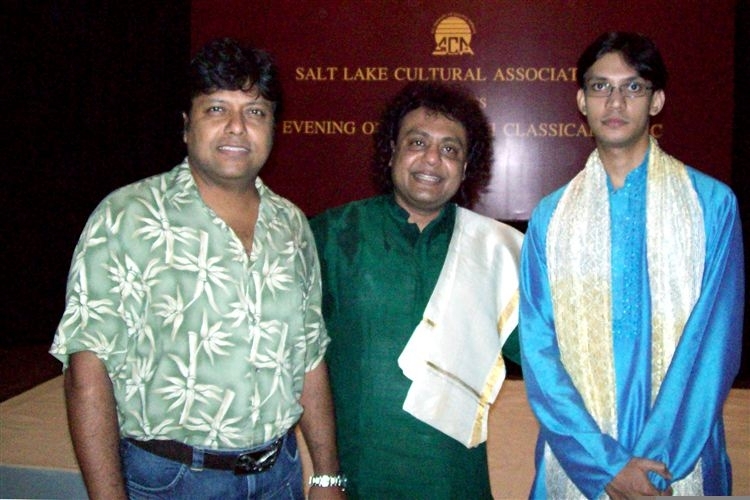 Performed classical solo in G D Birla Sabhagar (Kolkata) for Salt Lake Cultural Association in August 2008. 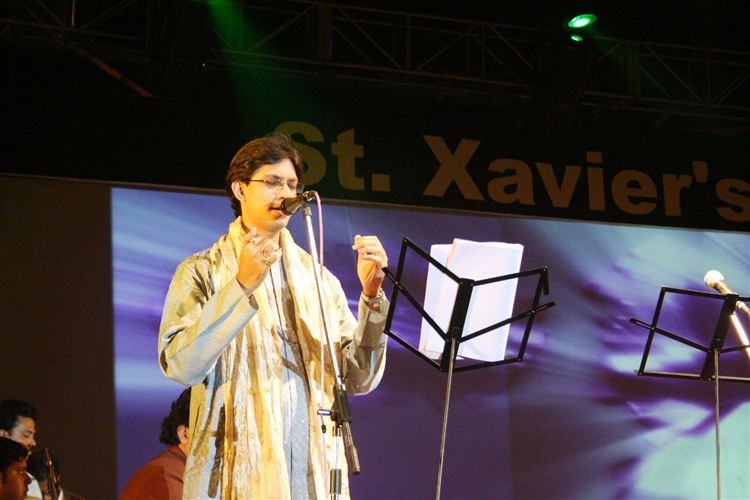 Performed at Belmont University, New Mexico State University, Dallas (Antorik), Detroit (Bichitra), New Jersey (Kallol) and others during US Durga Puja tour 2008. Performed at Naad-Brahma Sangeet Sammelan in Sodepur – WB. 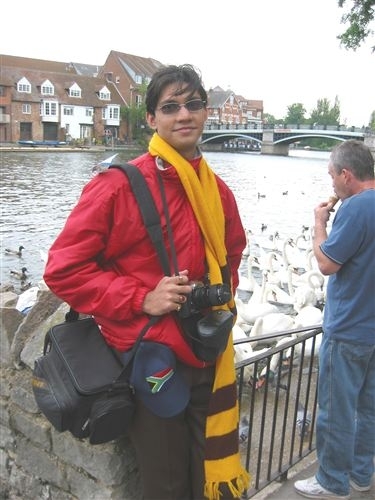 – December 2008. 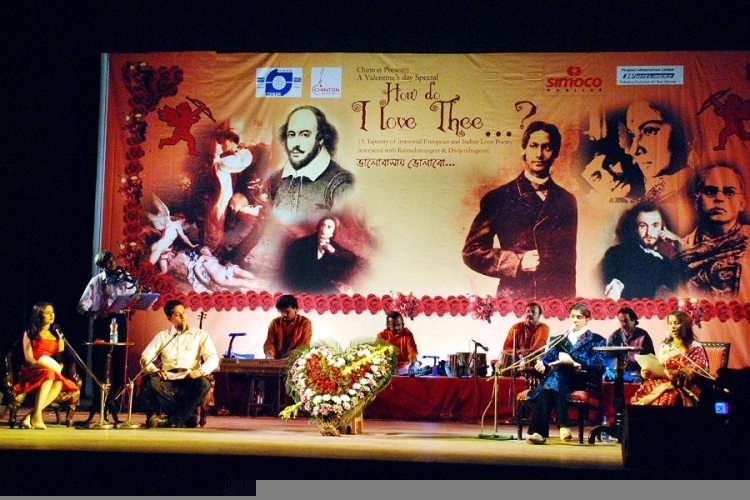 Conceived and performed at “How Do I Love Thee”, a special show for Valentine’s Day, featuring Parambrata Chatterjee, Debleena Dutta, Raja, Shreya Guhathakurta and Sounak. 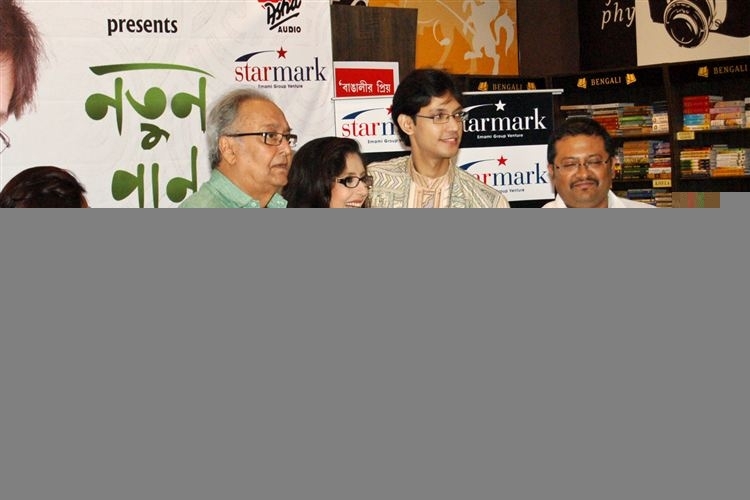 The show was directed by Sankarlal Bhattacharjee. February 2009. 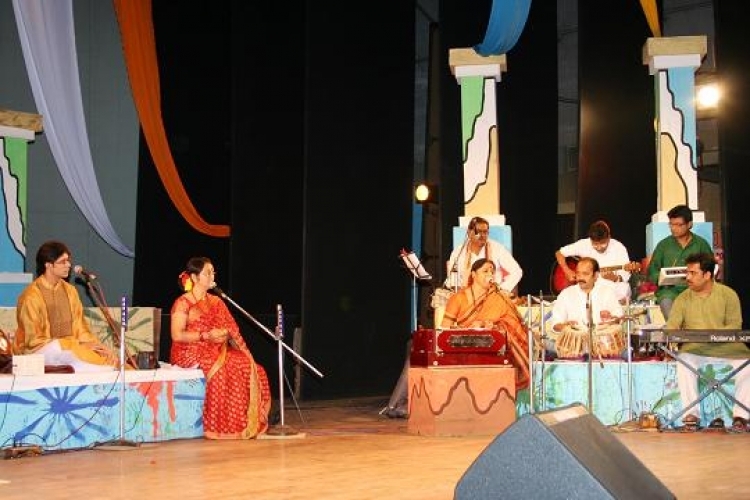 Performed at Bongo Sankriti Utsav - Mumbai. February 2009. 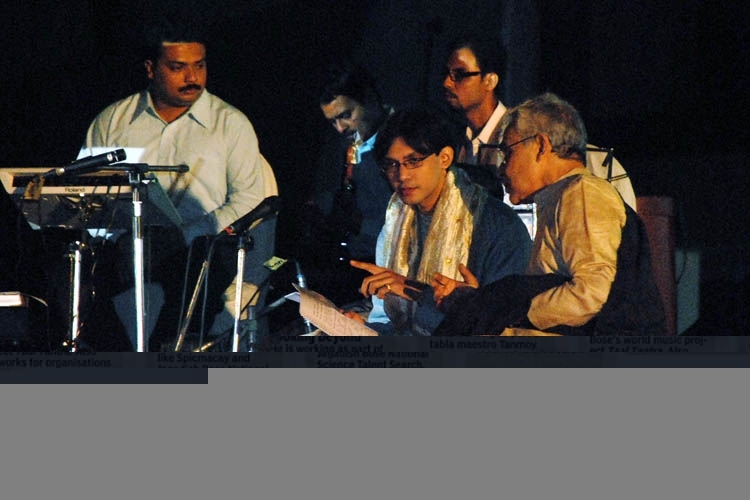 Performed at a solo Classical music concert arranged by Udayan and Bade Ghulam Ali Khan Yadgaar Sabha at the National Gallery of Modern Art – Mumbai 2009. 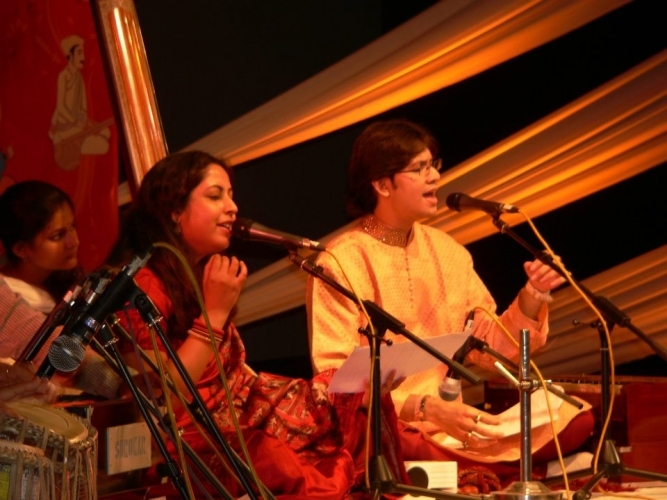 Performed at the NABC (Bongo Sanskriti Sammelan) in San Francisco in July 2009. 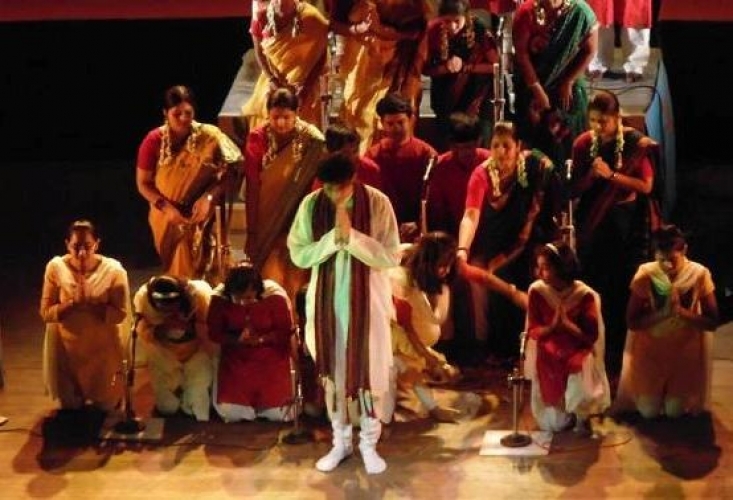 Directed and performed at Rabindra Utsav 2009, a National festival of theatre, dance and music. 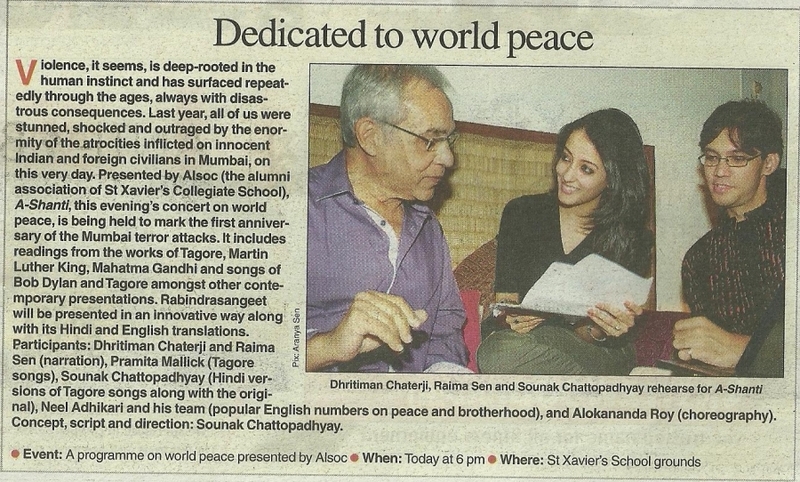 Conceived and performed in special Peace concert organized by ALSOC – ‘A Shanti’ (a contemporized presentation on works of Tagore and others) on 26th November 2009, with Dhritiman Chaterji, Raima Sen and Pramita Mallick. 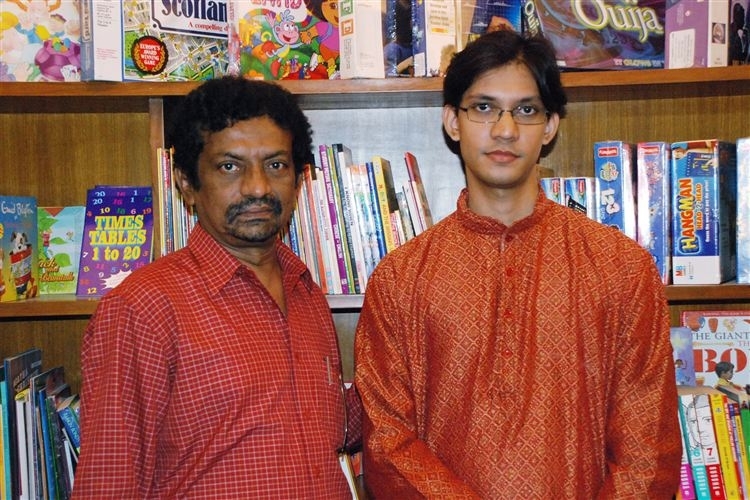 Performed and directed show ALLITERATIONS (a concept fusing English poetry and Tagore’s compositions) for the Tagore Society – Singapore, with Pramita Mallick and actor Barun Chanda. December 2009. 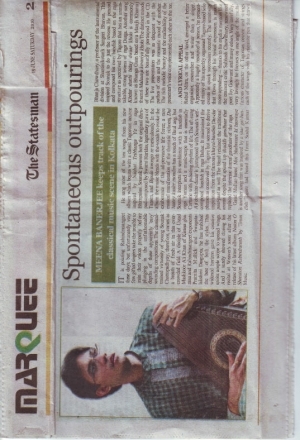 Solo recital at ICCR Kolkata at a concert titled ‘Tomari Ragini – ‘Rabindrasangeet and Refraction of Ragas’. – December 2009. 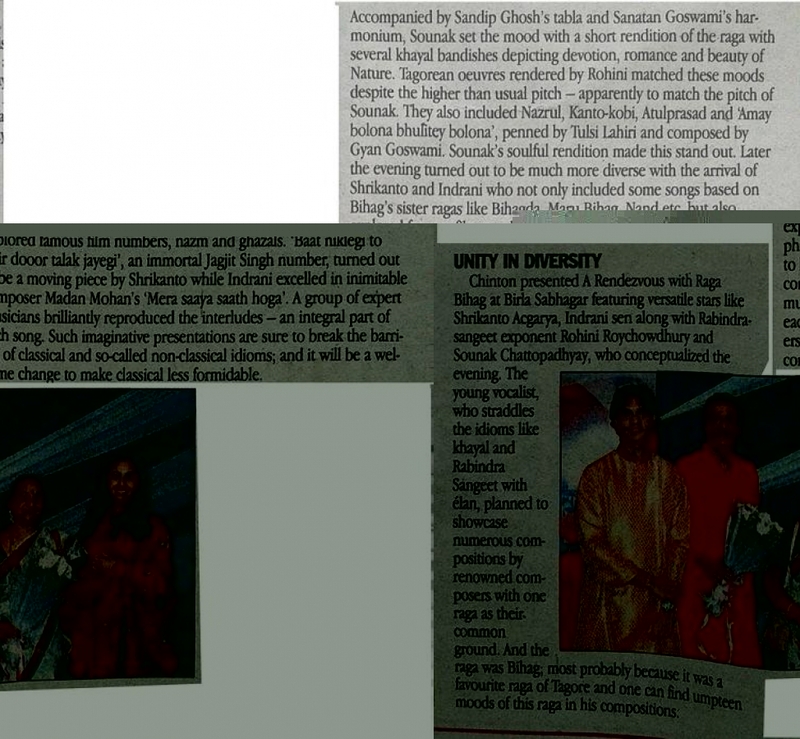 Uttarpara Sangeet Sammelan – January 2010, sharing stage with the likes of Ust. 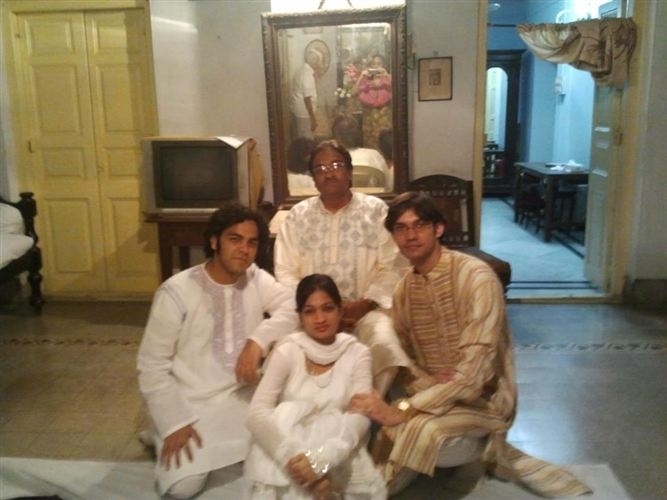 Rashid Khan and Pt. Hariprasad Chaurasia. Presented and performed in SPRINGS OF LOVE, Chinton’s second Valentine’s Day special. 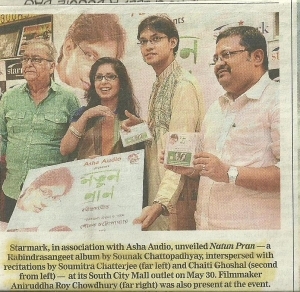 Co-artists were Purbayan Chatterjee, Jaya Seal Ghosh, Subhajyoti Guha, Anubrata Chatterjee, Rupashree Bhattacharya and Smt. Veena Kichlu. February 2010. 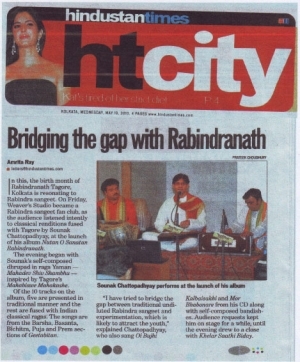 Performed at Times of India special series of concerts commemorating 150 years of Rabindranath Tagore in June 2010. 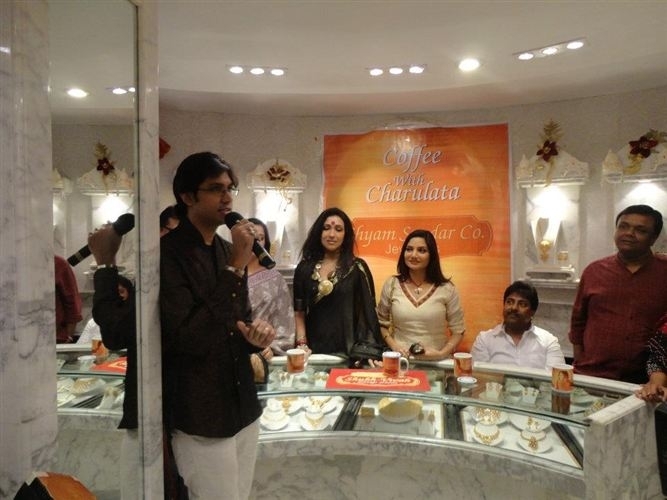 Performed at the first Regional Bengali Conference organized in Nashville Tennessee USA, in July 2010. 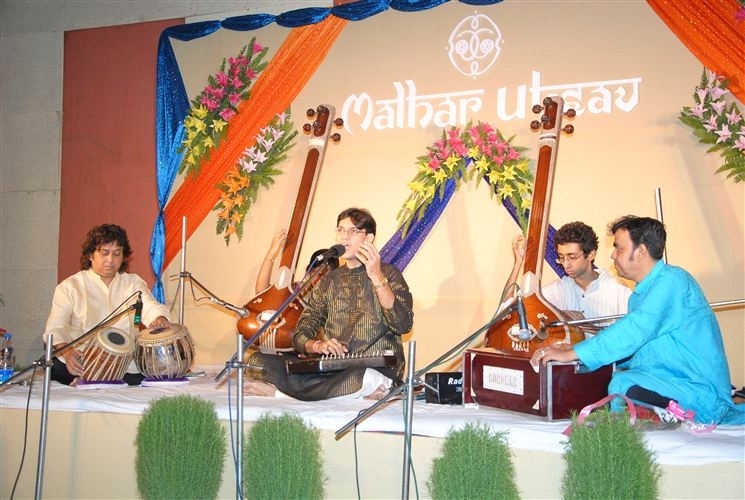 Performed at Malhar Utsav with Subhen Chatterjee, organized by Calcutta Club, Kolkata in July 2010. Performed at Chicago, Boston, Baltimore, Atlanta, New Jersey and other cities in USA during fall concert tour – October 2010. 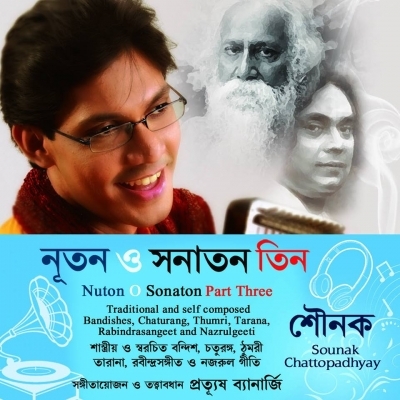 Classical concert at Krishnanagar Sangeet Sammelan - December 2010. 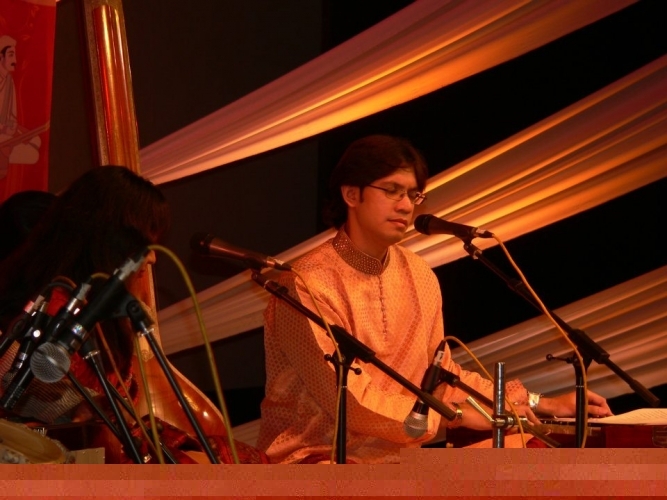 Performed at a special concert dedicated to Rabindranath Tagore’s 150 years at The Dover Lane Music conference – January 2011. 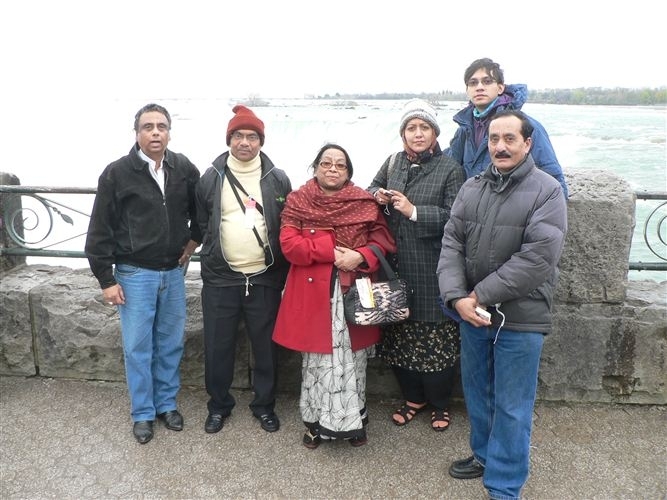 Basanta Utsav and Rabindra Jayanti celebrations in Toronto (Canada) April 2011. 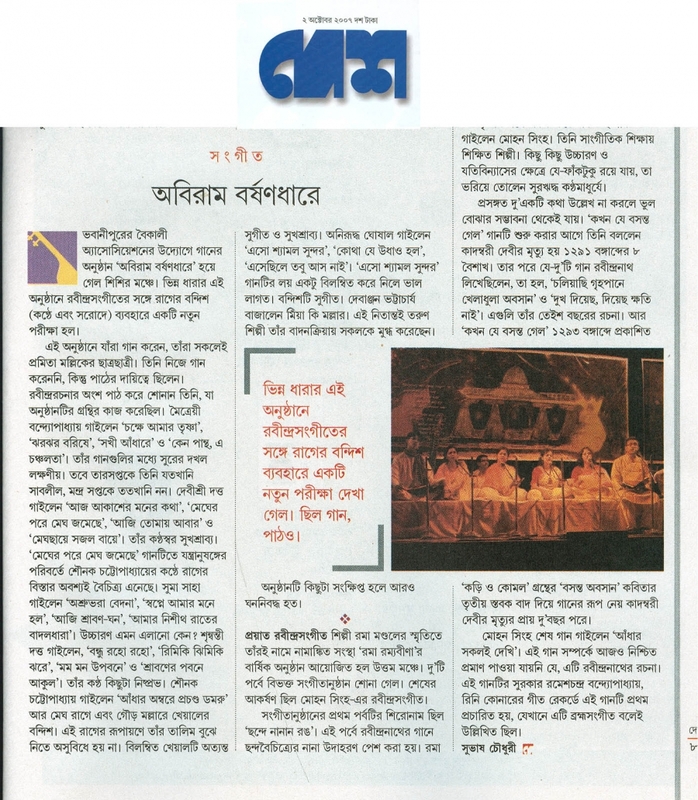 Special Rabindra Jayanti Concert Tour conducted by the Cultural Association of Bengal (USA) in NYC, NJ and other US cities. – May 2011. 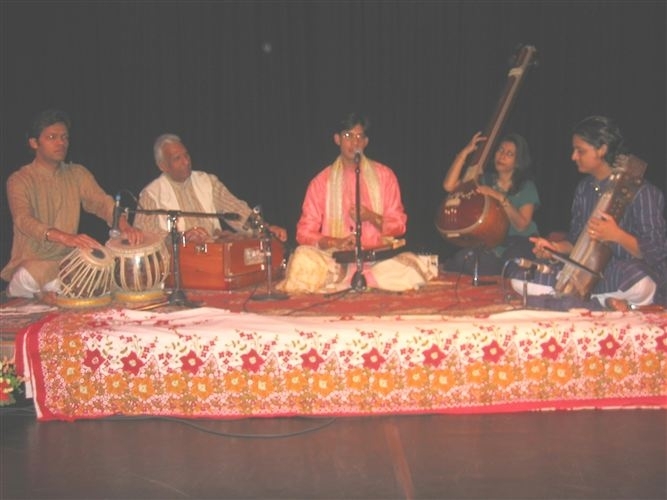 Participated in and represented India at an International Music residency at the Omi International Art Centre upstate New York along with 14 other musicians from different countries. 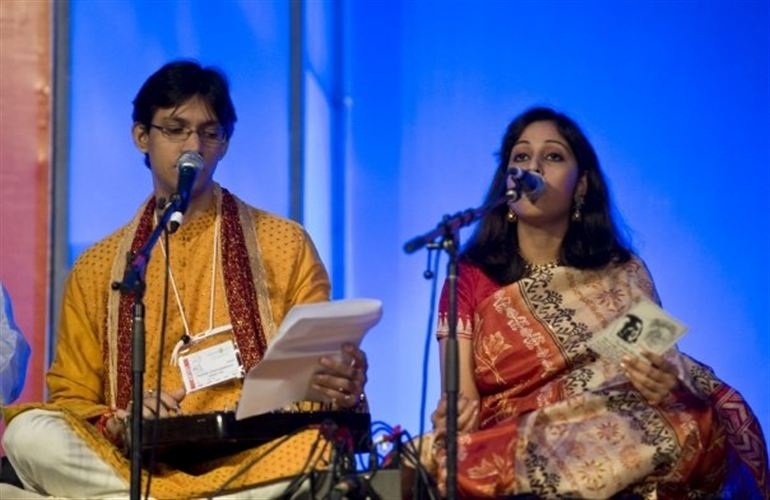 Performed at India Festival in Baltimore USA – November 2011. 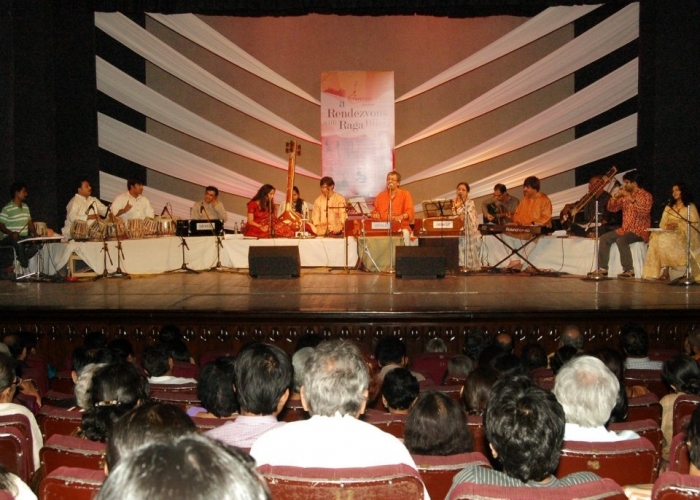 Classical concert at Moore Avenue Music Conference, Kolkata – December 2011. 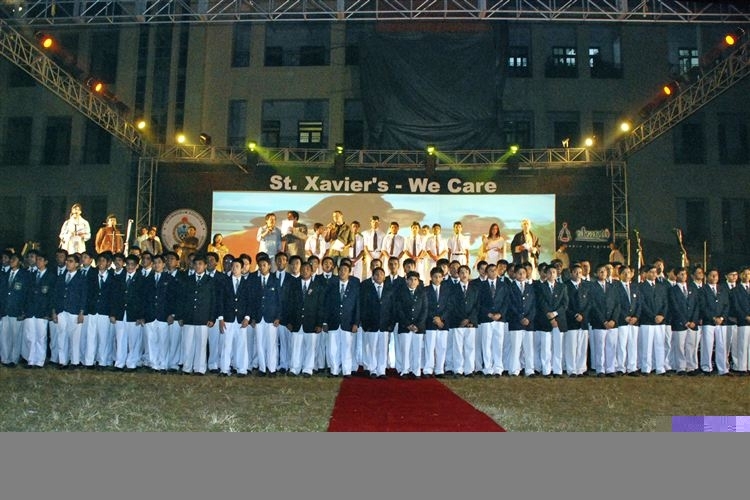 Concert for the Bengal Club in Mumbai – December 2011. 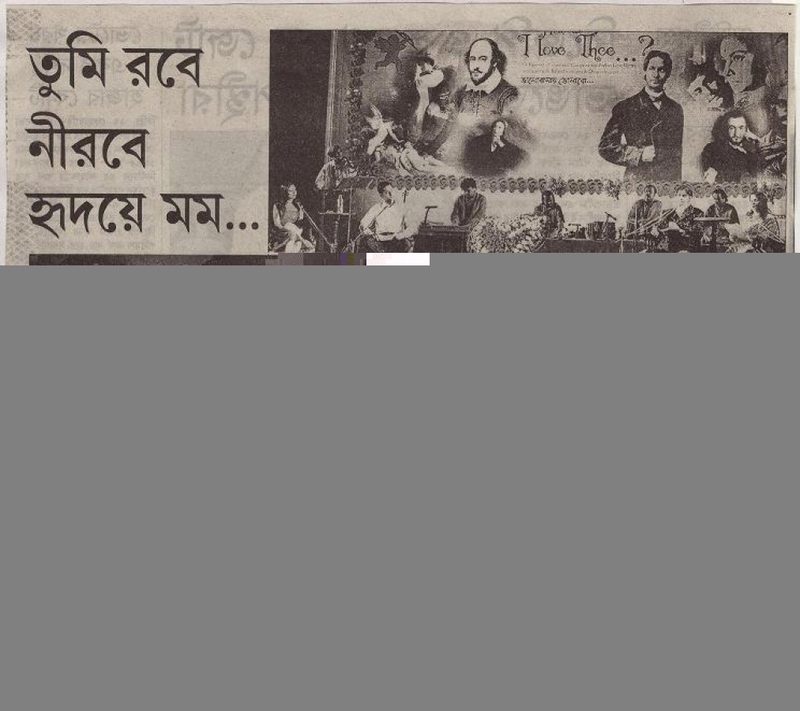 Special concert on 150 years of Rabindranath Tagore at Uttarpara Sangeet Sammelan - January 2012. 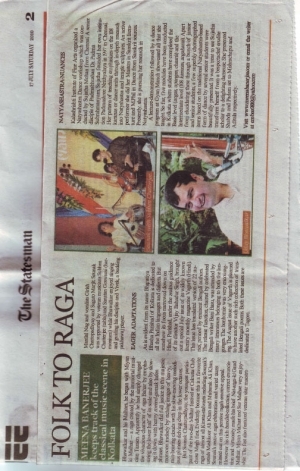 Ideated and performed at "A Rendezvous With A Raga" , a concert on Raga Bihag and its influences on different genres of music. 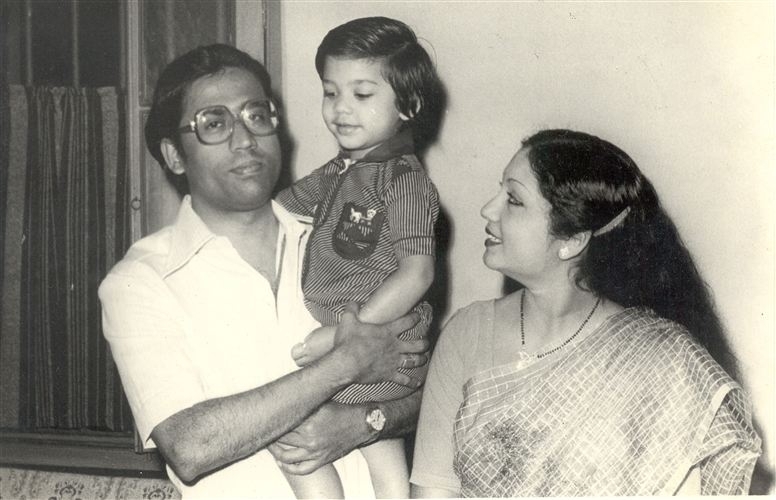 Co artists - Srikanto Acharya, Indrani Sen and Rohini Raychaudhury. March 2012. 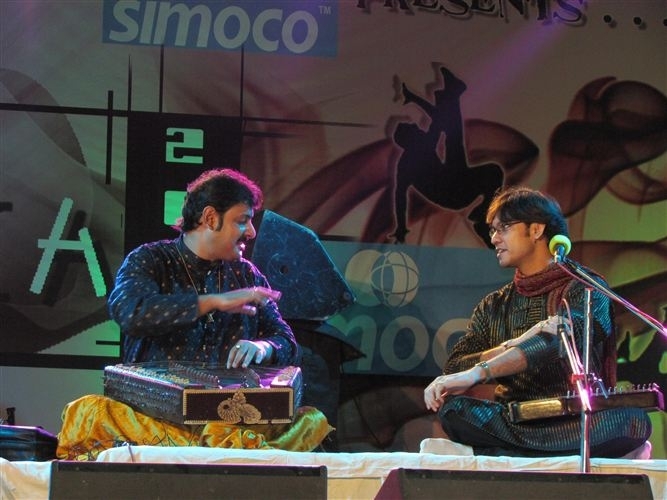 Performed at a classical Jugalbandi (duet) with santoor Maestro Sandip Chatterjee at Rebeca - College fest of Bengal Engeneering and Science University - Shibpur. - April 2012. 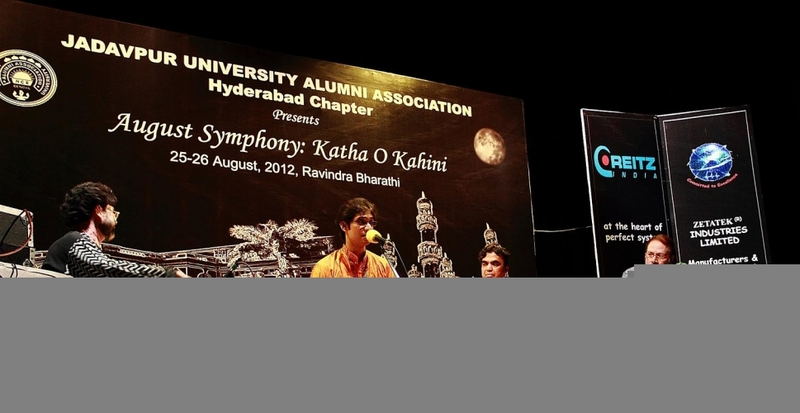 Performed at Jadavpur University Alumni Association Hyderabad Chapter Concert - August symphony - August 2012. 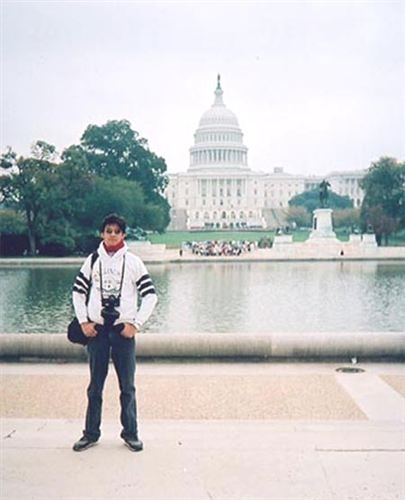 Concert Tour of USA - October- November 2012. Solo Classical Concert for ICMDS at Raleigh (NC). 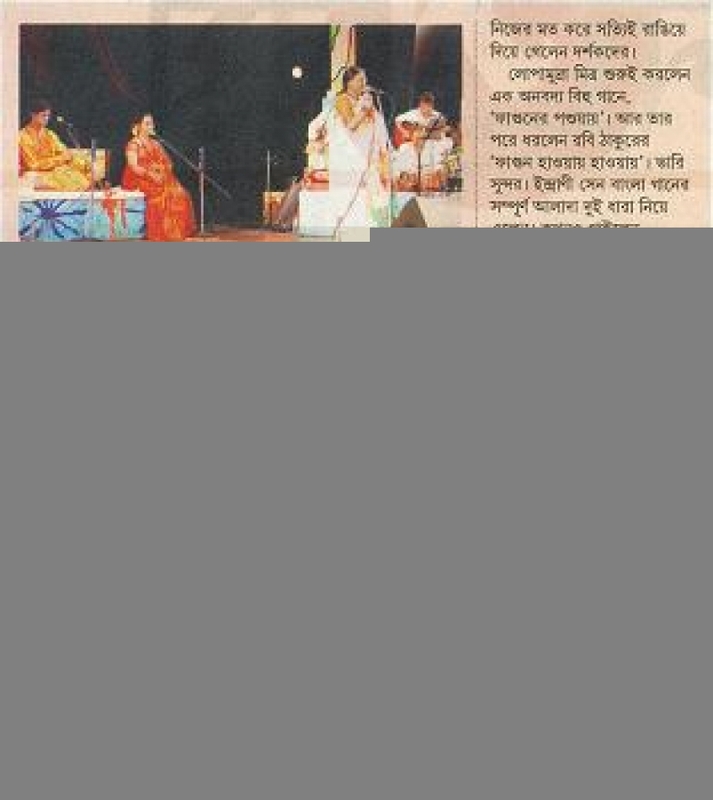 Classical Concert in Durgapur - December 2012. 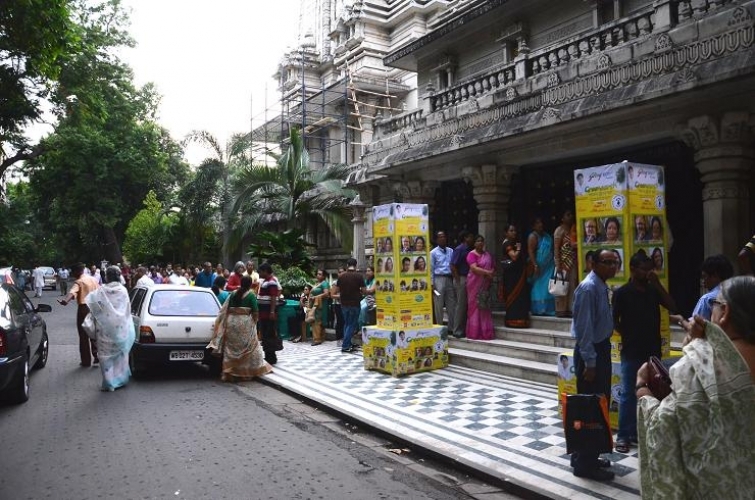 Tagore Festival organized by Tagore Society Jamsedpur - December 2012. 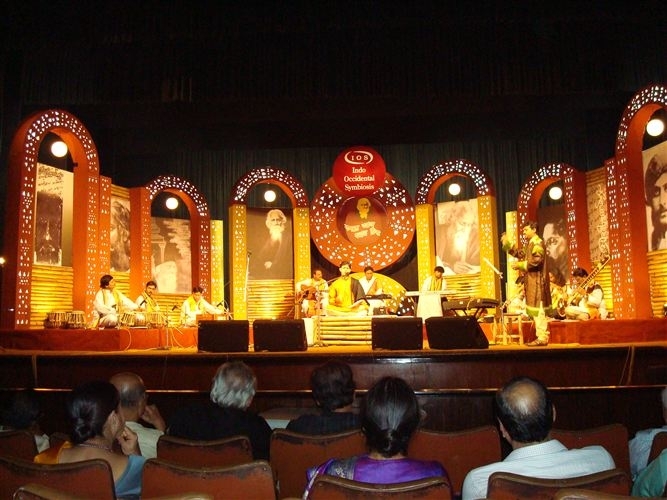 Special Concert for 150th Birthday of Swami Vivekananda by Barrakpore Ramkrishna Vivekananda Mission at Science City auditorium Kolkata - January 2013. 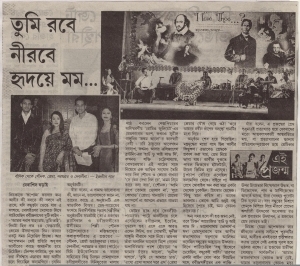 Special Concert by Suro kavya Trust on the Birthday of Dilip Kumar Roy - January 2013. 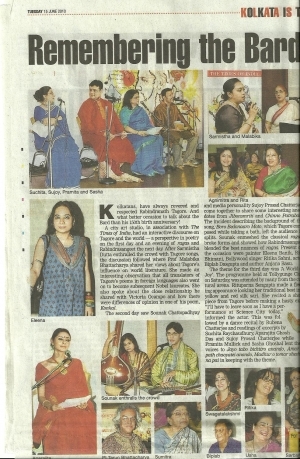 Concert on 100 Years of Indian Cinema at Calcutta Rowing Club - February 2013. 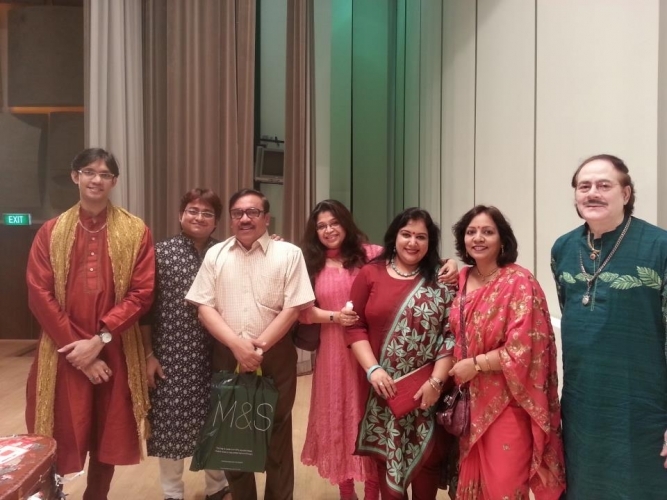 Directed and Performed at Chinton's 5th concert, "Colours of Spring" with Lopamudra Mitra, indrani Sen, Sandip Mallick, Shamik Pal and Bibhabendu Bhattacharjee. 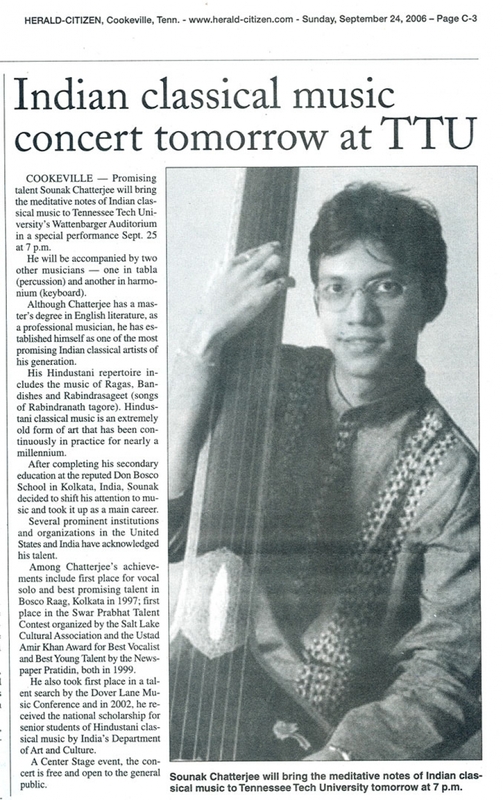 Solo Concert for Bengali Association in Jakarta, Indonesia - April 2013. 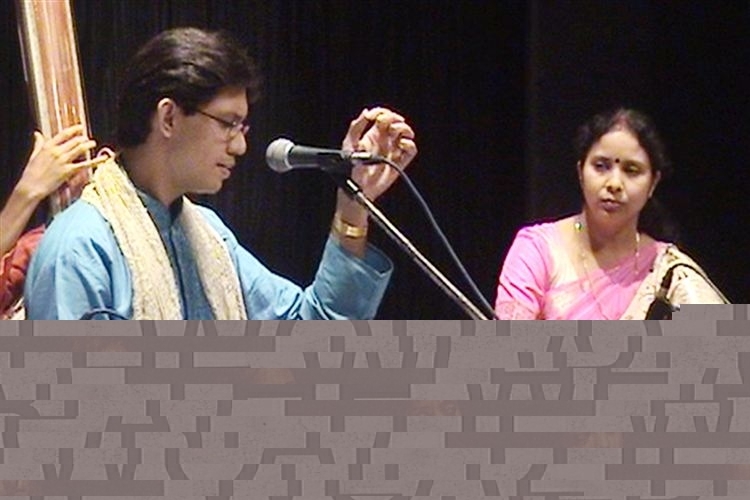 Solo concert at Raj Bhavan Kolkata - April 2013. Solo concert in Singapore for Tagore Society - May 2013. 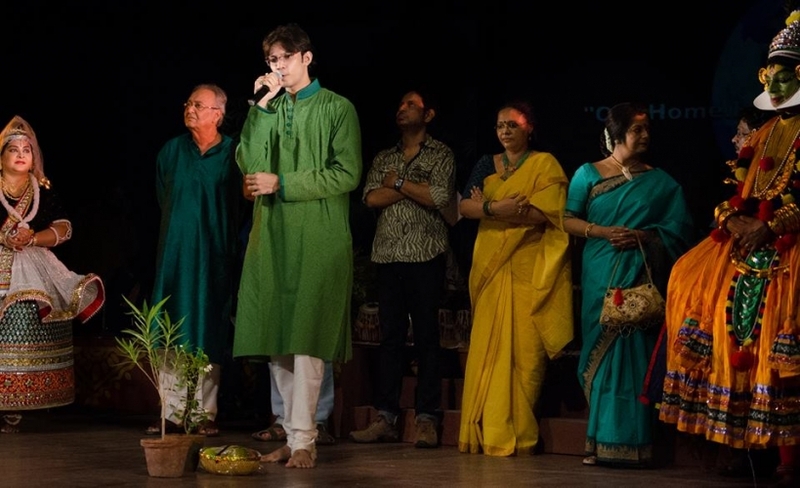 Directed and performed for Green Earth (Shyamol Shukher Dhora) a multi starrer, multimedia show based on Rabindranath Tagore's thoughts on Man and his Environment. The show was dedicated to the World Environment Day. - June 2013. 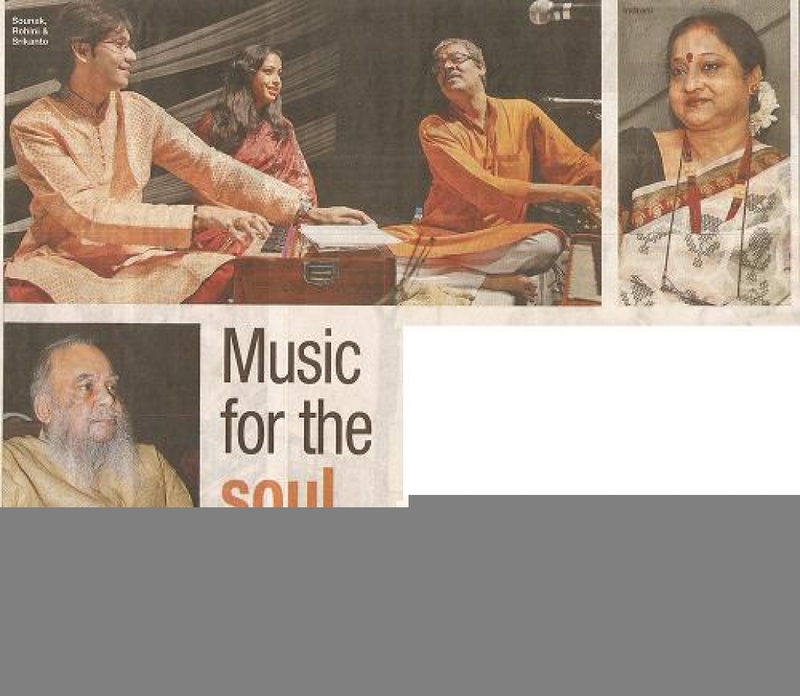 Performed Jugalbandi (Duet) classical and fusion based concert with Sandip chatterjee (Santoor) in Muscat (Oman) - April 2014. Presented debut international concert of a new fusion concept - RAGASPHERE in Toronto - May 2014. 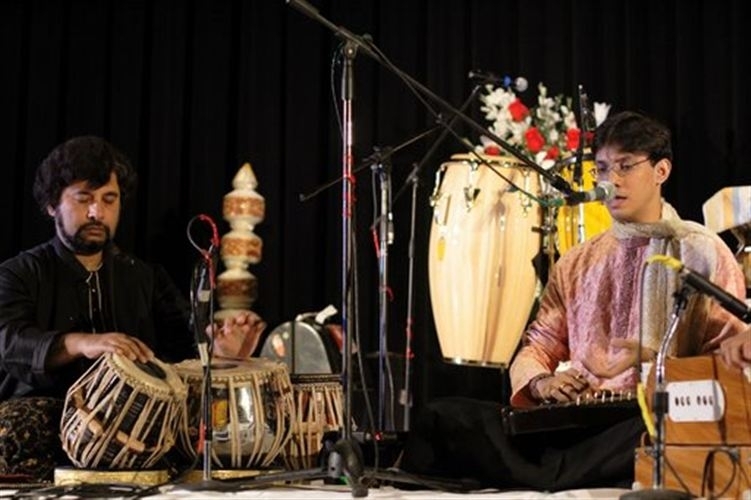 Performed at Bongo Sanskriti Utsav (Chicago) - May 2014. 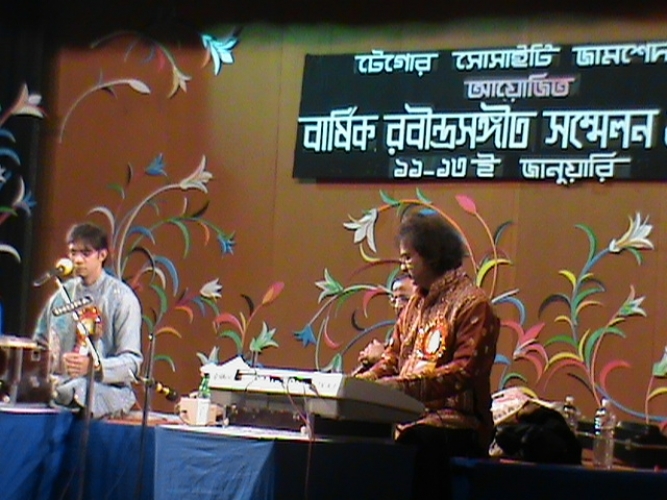 Solo Concert at Hazaribagh - February - 2015. 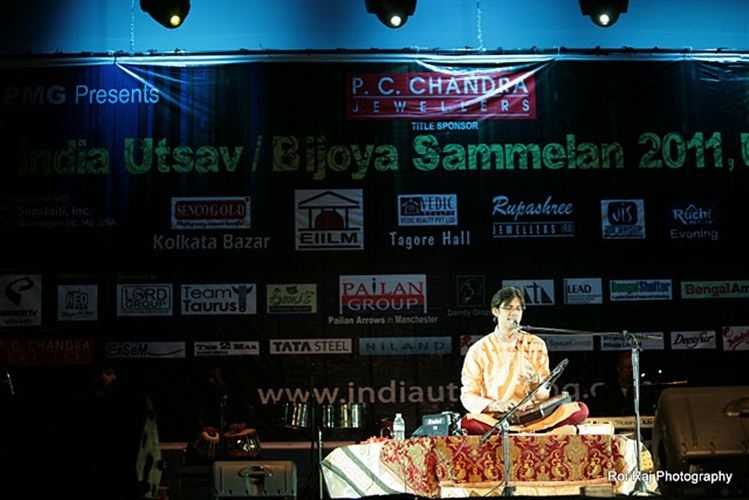 Geetanjali Utsav in Shantiniketan - January 2016. Solo concert tour in Australia (Sydney and Melbourbe) - July 2016. India Festival in Singapore. 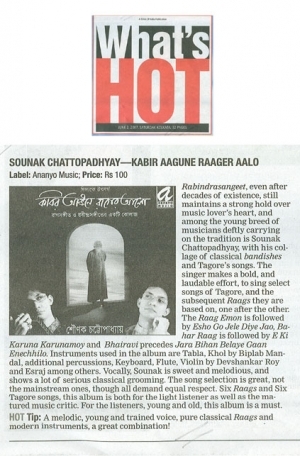 Performed on influences on and of Tagore in traditional and contemporary music - December 2016. Solo Concert tour of the UK in May-June 2017. Directed and performed in Peace Concert in London - June 2018. Solo concert tour in Australia (Sydney and Perth) July 2018. Durga puja concert in Kuwait with Samya Karpha October 2018. 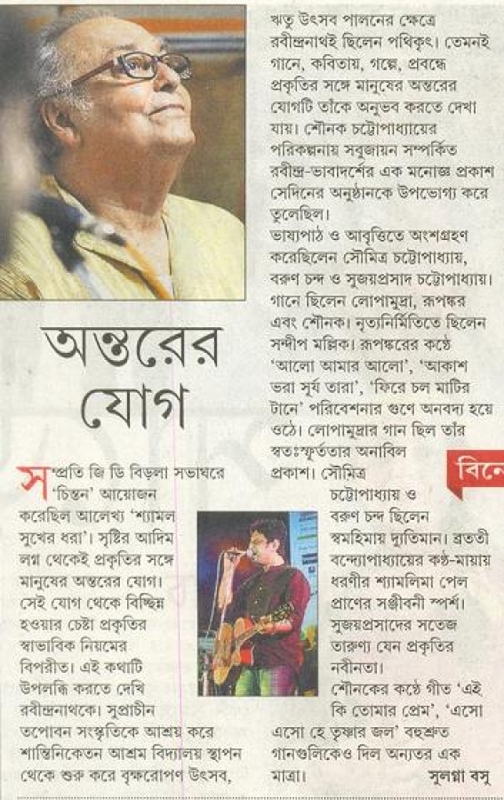 Solo performance at Arth, a cultural fest of Zee TV in Kolkata. December 2018. 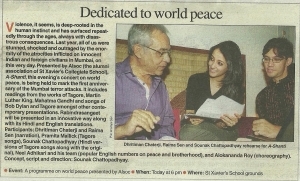 Performed and directed Ode to Joy, an International Peace Concert in Kolkata to mark 10 years of Chinton (Sounak's music school). The above mentioned performances are just some of Sounak’s major music concerts. 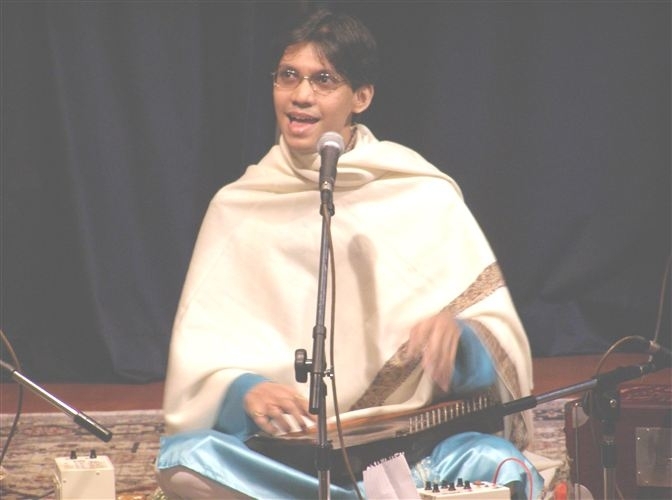 He regularly presents Classical Music, Rabindrasangeet and other forms of light classical or Bengali Art Music exclusively on numerous occasions in Kolkata and outside India as well. 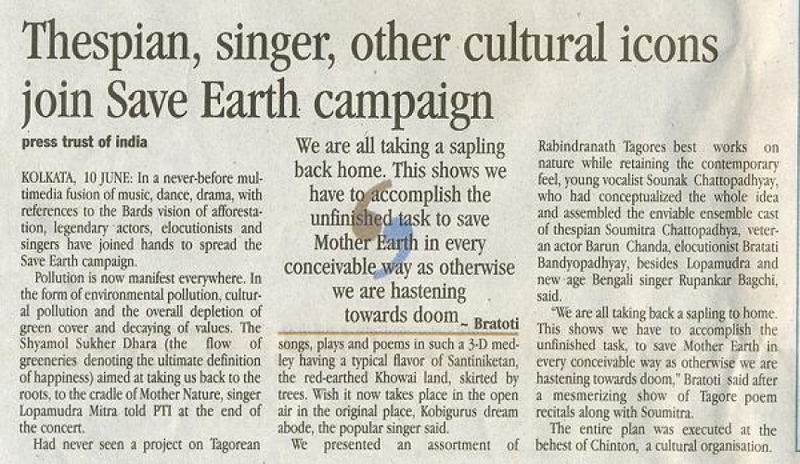 "In a never-before multimedia fusion of music, dance, drama, with references to the Bard’s vision of afforestation, legendary actors, elocutionists, and singers have joined hands to spread the Save Earth campaign. 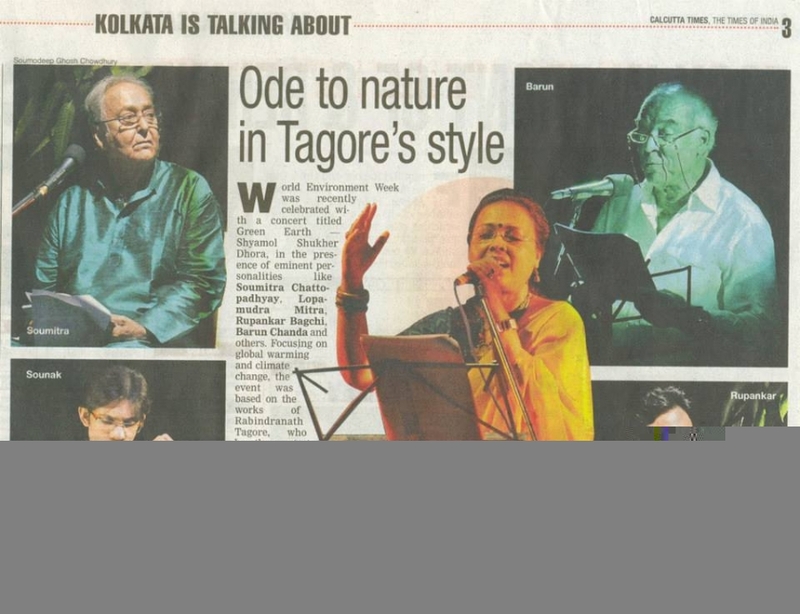 Such a project on Tagorean songs, plays and poems in such a 3-D medley having a typical flavor of Santiniketan, the red earthed Khowai land, skirted by trees had never been seen. "We presented an assortment of Rabindranath Tagore's best works on nature, while retaining the contemporary feel," young vocalist Sounak Chattopadhyay, who had conceptualized the whole idea and assembled the enviable ensemble cast of thespian Soumitra Chattopadhya, veteran actor Barun Chanda, elocutionist Bratati Bandyopadhyay, besides Lopamudra and new age Bengali singer Rupankar Bagchi, said. " 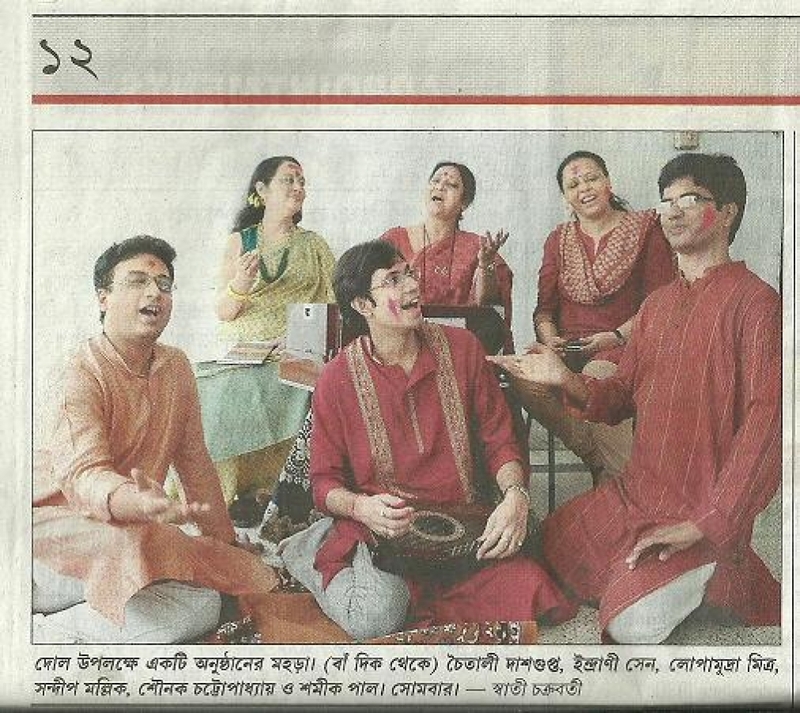 The PTI, on Green Earth - "Shyamol Sukher Dhora"
“…This is no contemporary experiment in jazzing up Tagore. 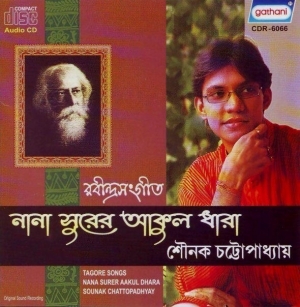 Classics such as Ei udashi haowa, Nil anjana ghana and Mone ki dwidha are present with their pristine exuberance… Sounak takes the exercise to dizzy heights when he renders the spring song, Aji dakhino duar khola, the way Tagore had conceived it, in Raga Bahar…and then juxtaposes his own composition based on the same chalan. 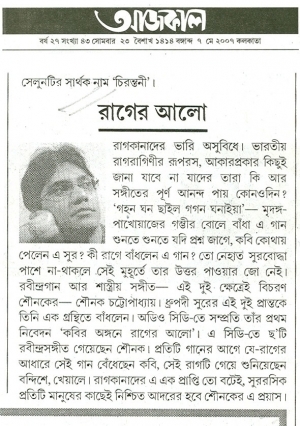 Sur Sangbad : News bulletin from Surdhwani (UK). 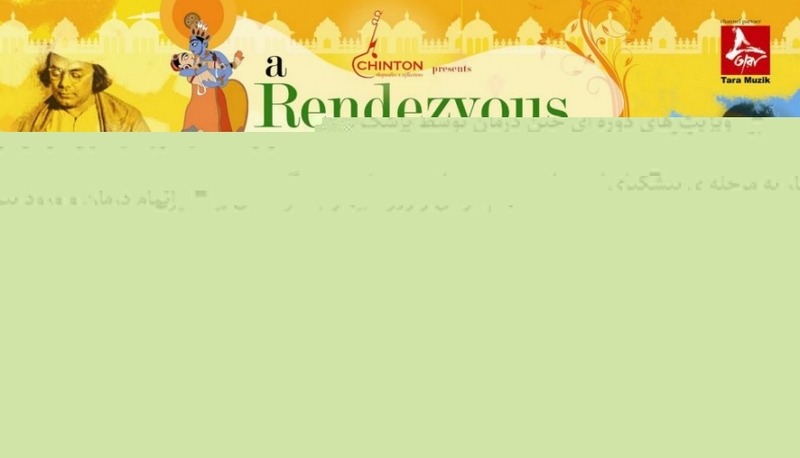 As an organization, Chinton is five years old and still in its infancy, but they have given the city some of the most exciting and novel presentations in music in the last few years beginning with their trend setting Valentine's Day shows and other programmes. 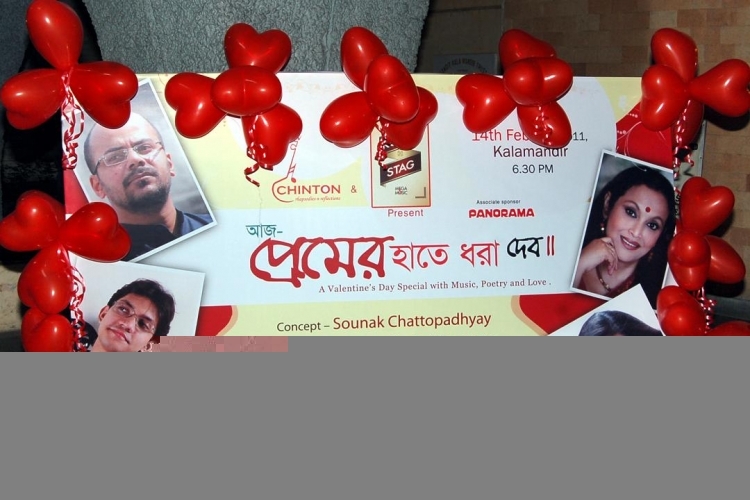 Chinton set sail on February 2009 to celebrate love, to celebrate Valentine's Day in a way that the city of Kolkata probably never saw before. 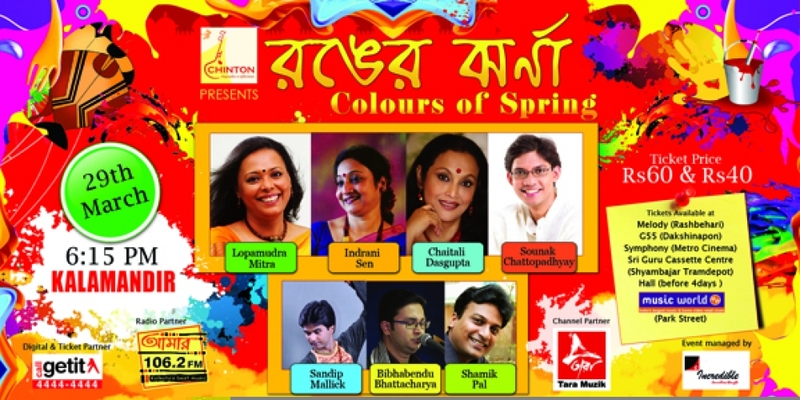 Chinton’s latest Spring concert - "Ronger Jhorna - Colours of Spring", on March 29th, 2013, rocked Kalamandir and has been one of their best productions. Chinton is the brain child of young vocalist Sounak. It is an attempt to propagate fine arts and music among youngsters today and create new audience and awareness for cerebral art music. 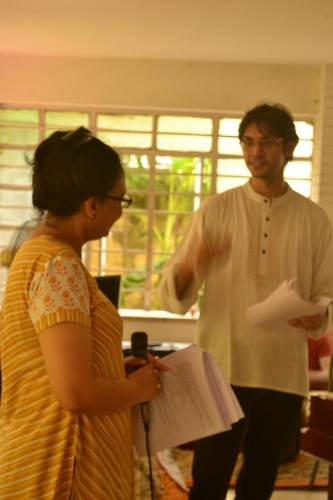 Parallel to stage productions, Sounak has been quitely training his students in classical music and Ragas and Rabindrasangeet in seperate batches. 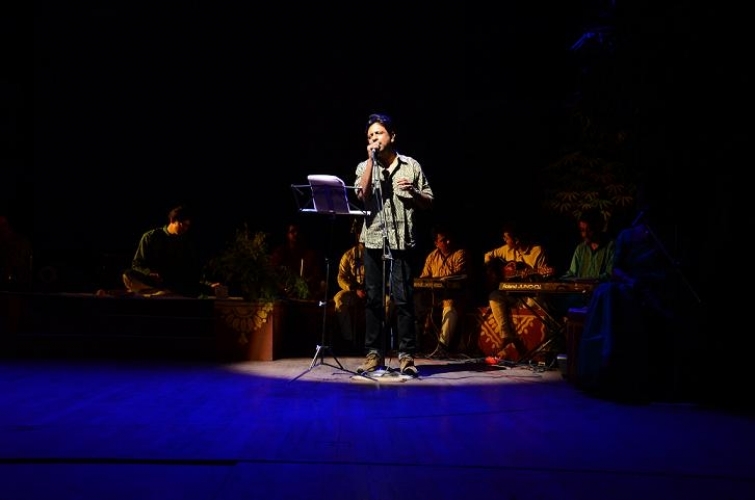 He introduced and showcased them for the first time at the 2013 spring concert - "Ronger Jhorna". Sounak envisages a bright future for Chinton as an institution of art and music in the years to come as well and the seeds have already been sown. Transcending entertainment but not denying it, Chinton plans to continue on its journey with new shows and new ideas integrating fine arts and socialy relevant issues. Ther latest was also the biggest so far. 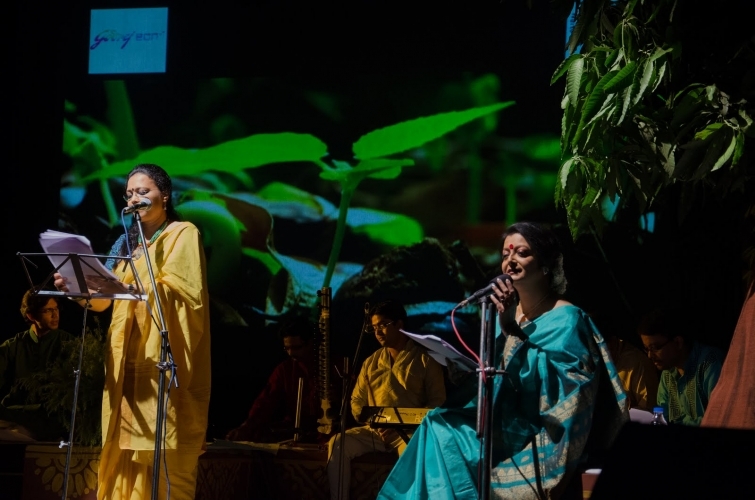 "Green Earth - Shyamol Sukher Dhora", a concert dedicated to Global warming and the environment as depicted in the works of Rabindranath Tagore, was staged on June 8th, 2013. It was the talk of the town and one of the biggest concerts of the city this summer. 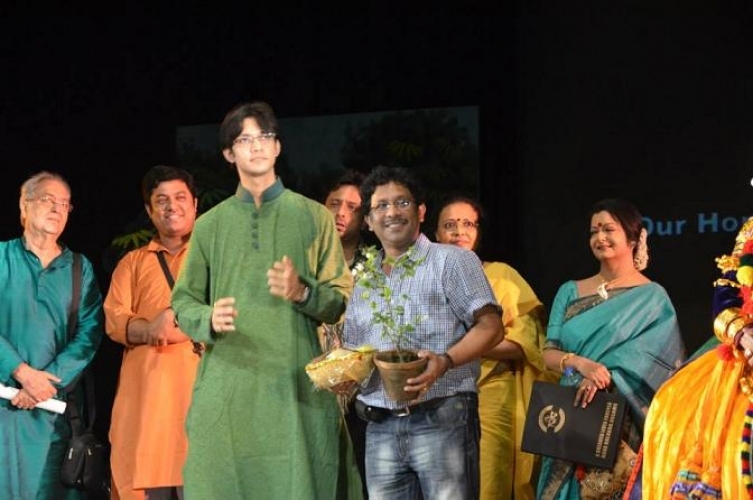 "In a never-before multimedia fusion of music, dance, drama, with references to the Bard’s vision of afforestation, legendary actors, elocutionists, and singers have joined hands to spread the Save Earth campaign. 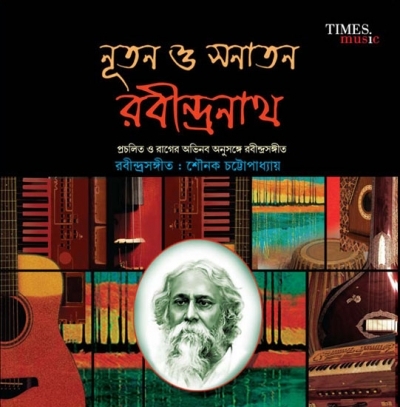 Such a project on Tagorean songs, plays and poems in such a 3-D medley having a typical flavor of Santiniketan, the red earthed Khowai land, skirted by trees had never been seen." - PTI on Green Earth. "Never-before", it truly was. 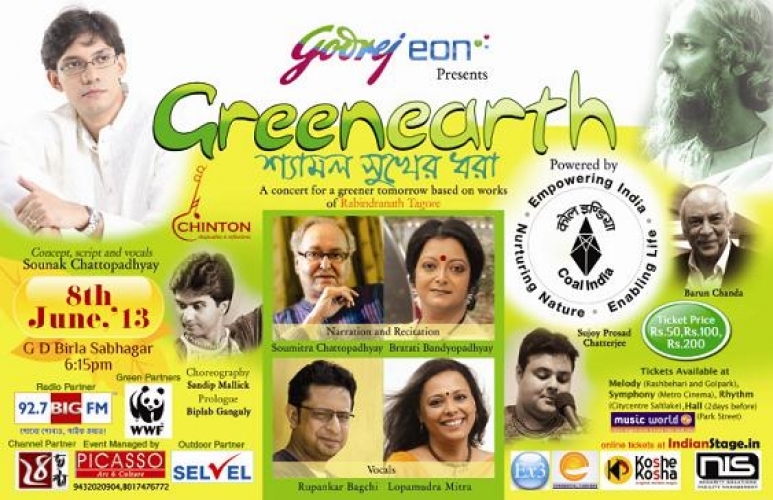 With spectacular visuals, recitations, music and dance, Green Earth was a show, the like of which Kolkatans do not get to see very often. 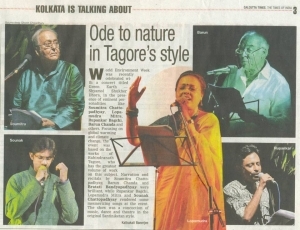 The concert which was dedicated to preservation of the environment, global warming and climate change, was based on works of Rabindranath Tagore. Tagore was the first environmentalist in an age when environment days were not even recognized. His monumental works on the subject formed the content of the programme. 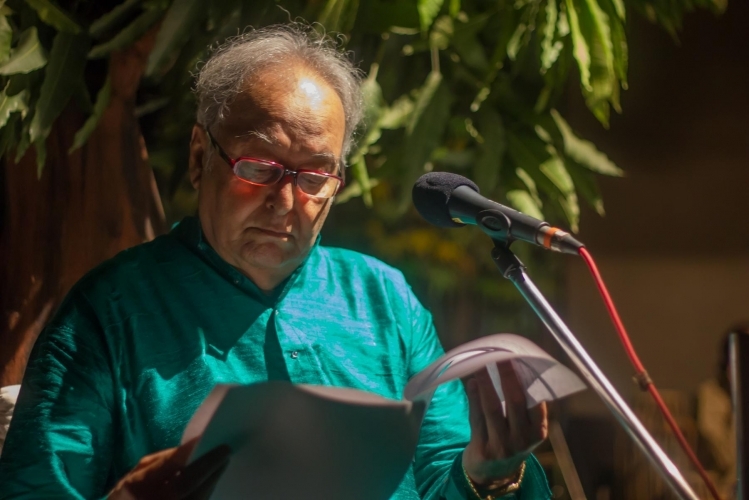 His infinite writings addressed to mother nature - poems, novels, plays, essays, the various Ritu Utsavs (Seasonal festivals) and of course the eventual foundation of Viswabharati are proof of his relentless longing to return to the cradle of Mother Nature. 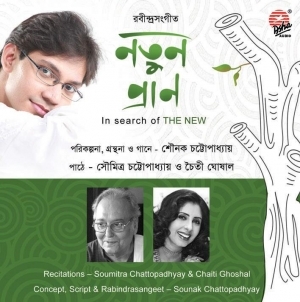 The concert saw narration and recitals from Soumitra Chattopadhyay, Barun Chanda, Bratati Bandyopadhyay, Sujoy Prosad Chatterjee while Rupankar, Lopamudra and Sounak rendered some mesmerizing songs at the event. 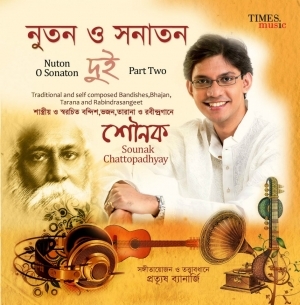 The concert was ideated by Sounak Chattopadhyay himself. It was a conceptual fusion of ideas, art and science, stalwarts and young artists, the traditional and the contemporary. 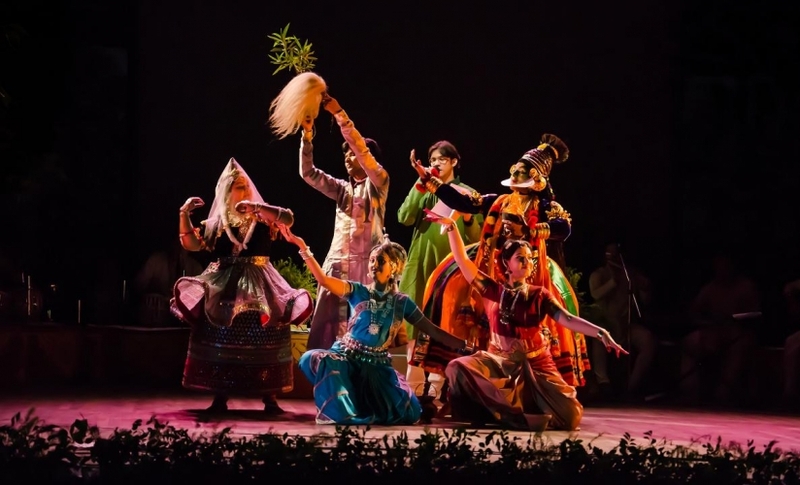 The stage was inspired by the Amrakunja of Shantiniketan and the scenes in the backdrop showed the spectacular nature scapes and graphic details on the extent of global warming. Five different classical dance forms were used to depict the five elements in the tree planting scene. In all the concert was a visual and aural treat for those present. It was a privilege for Chinton to associate with top national brands like Godrej Eon and Coal India as Title sponsors for the event. 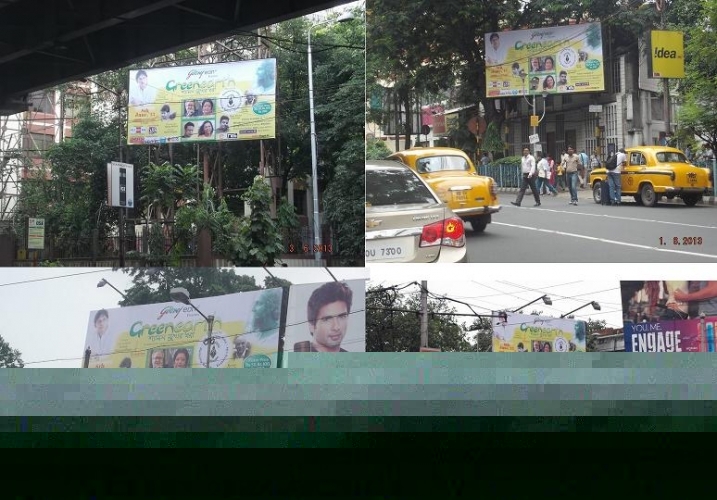 Also associated with Green Earth were 24 Ghonta as Television partners, Big FM as Radio partners, Selvel Advertizing as Outdoor Partners and WWF as a special Green Partner. 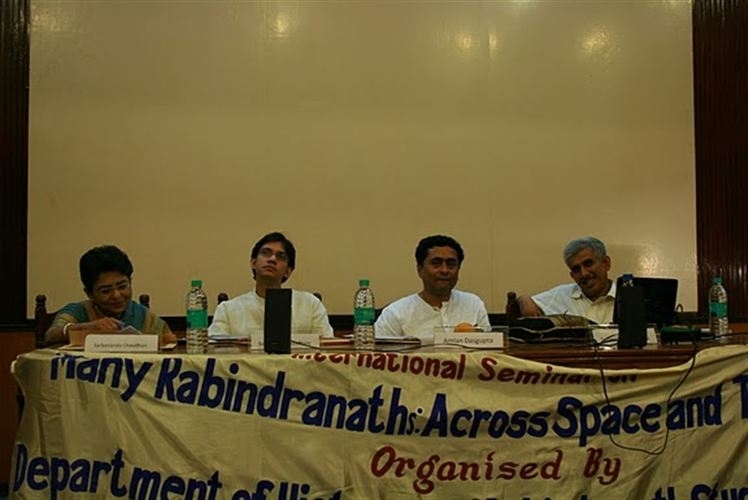 Green Earth was also supported by a host of Co sponsors. They were - Commercial Carriers, Ex3, Koshe Kosha Restaurant, NIS Security Solutions, Fitek Private Ltd.
Chinton is deeply indebted to all sponsors and associates for contributing to the success of the event. 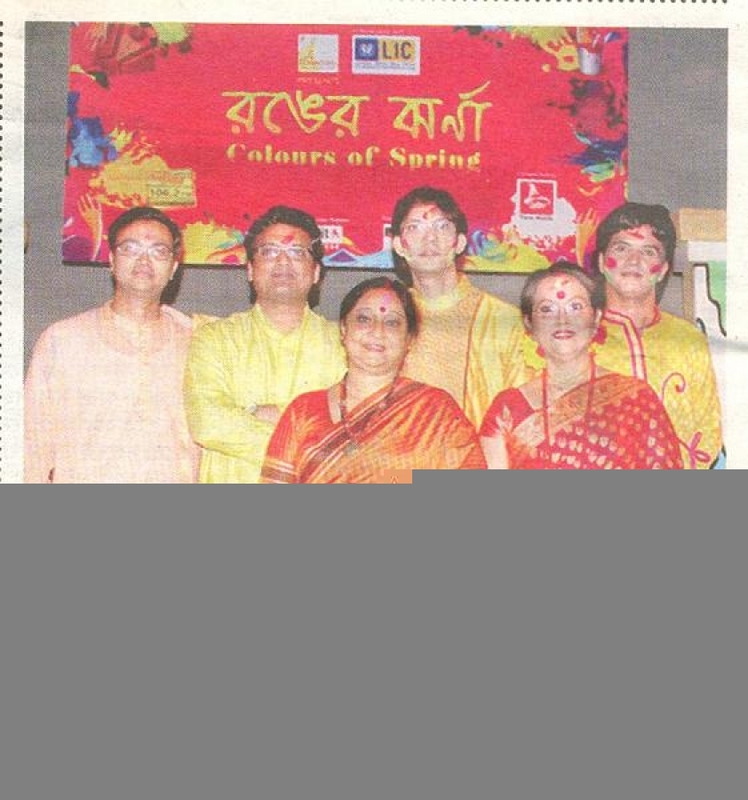 "Ronger Jhorna – Colours of Spring", was a concert that lived up to its name. The audience in Kalamandiran evening of colours in all its variety, in dresses, in dance and music. 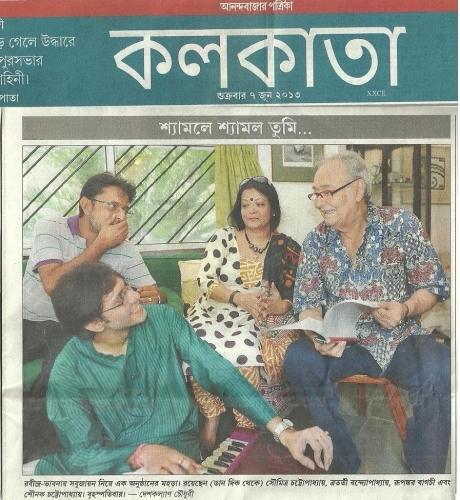 Stars Lopamudra Mitra and Indrani Sen rocked the house, as did the young stars Sounak, Shamik Pal and Bibhabendu Bhattacharya. Sounak himself showcased rare compositions from Jaideva’s Geet Govind and rare Taranas osed by Amir Khusro in addition to Khayal, Rabindrasangeet and semi classical Bengali songs. 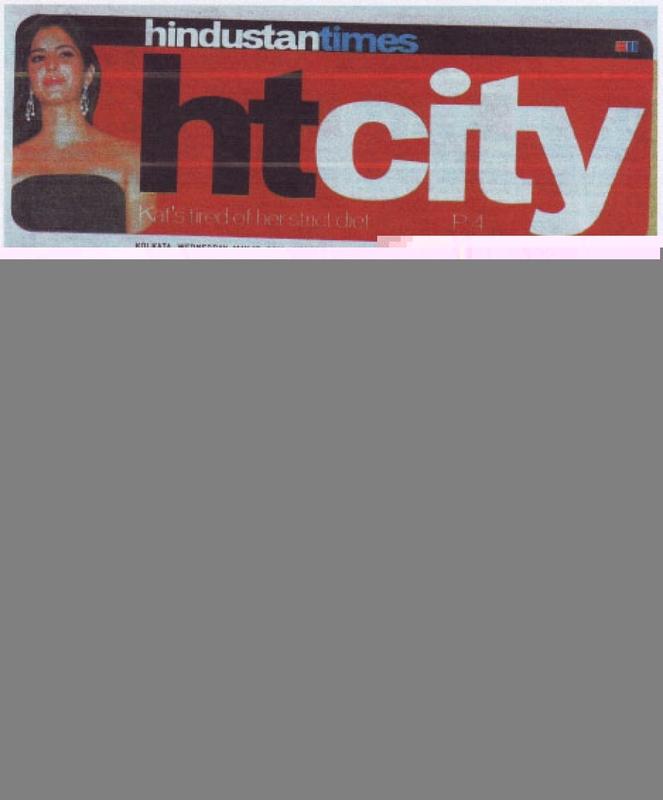 Danseuse Sandip Mallick won hearts with his brilliance and skill. 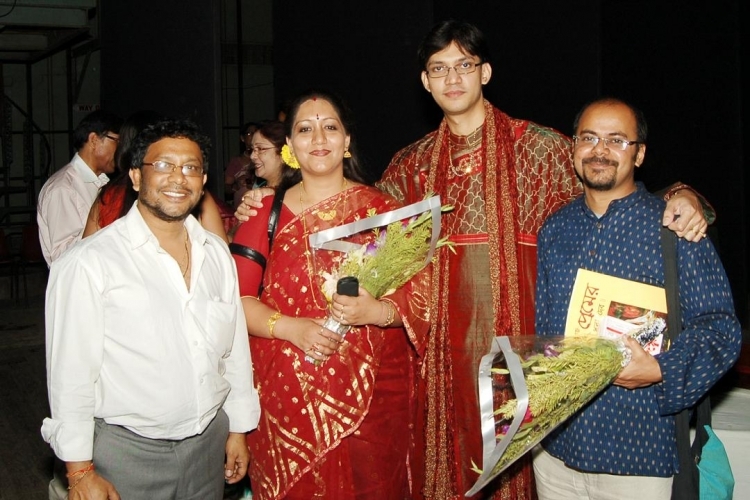 A full house at Kalamandir swayed with the music and dance and reveled in the colours of spring. 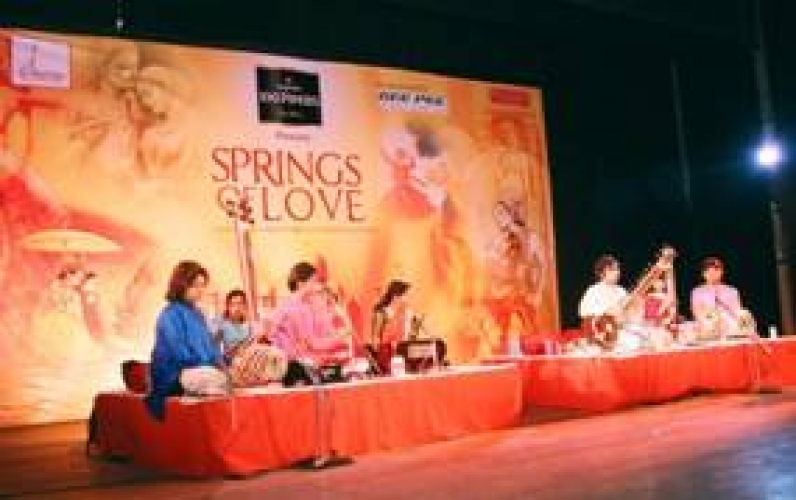 "Ronger Jhorna – Colours of Spring", was a concert that lived up to its name. The audience in Kalamandir was treated to an evening of colours in all its variety, in dresses, in dance and music. 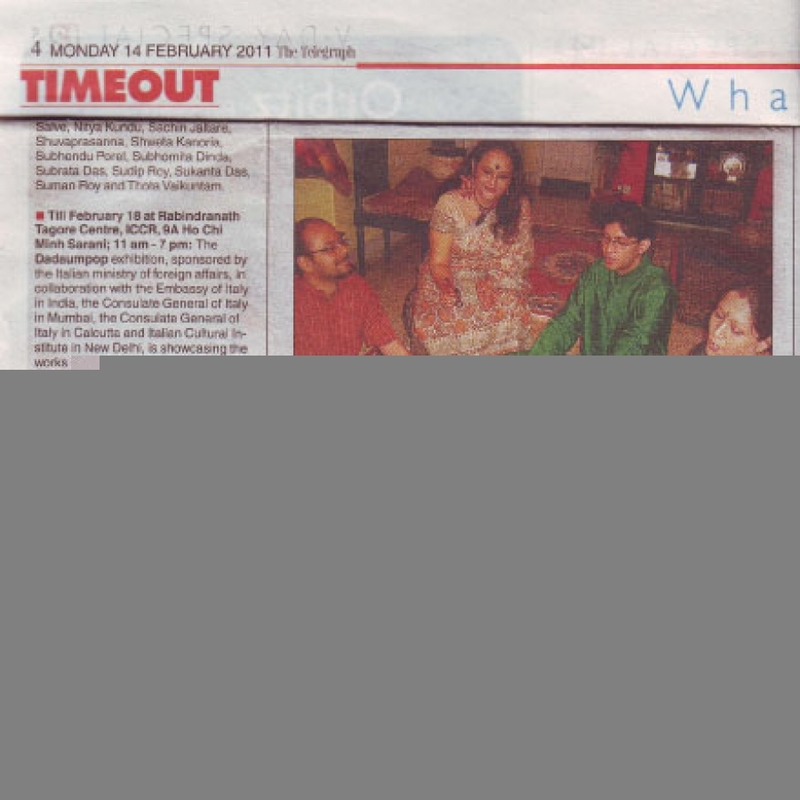 Stars Lopamudra Mitra and Indrani Sen rocked the house, as did the young stars Sounak, Shamik Pal and Bibhabendu Bhattacharya. 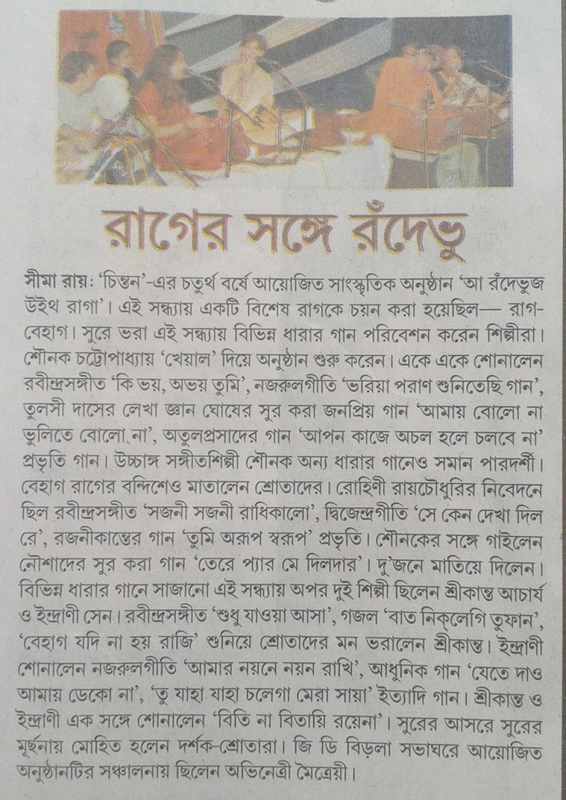 Sounak himself showcased rare compositions from Jaideva’s Geet Govind and rare Taranas composed by Amir Khusro in addition to Khayal, Rabindrasangeet and semi classical Bengali songs. 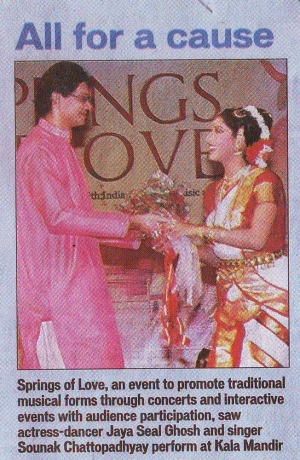 Danseuse Sandip Mallick won hearts with his brilliance and skill. A full house at Kalamandir swayed with the music and dance and reveled in the colours of spring. 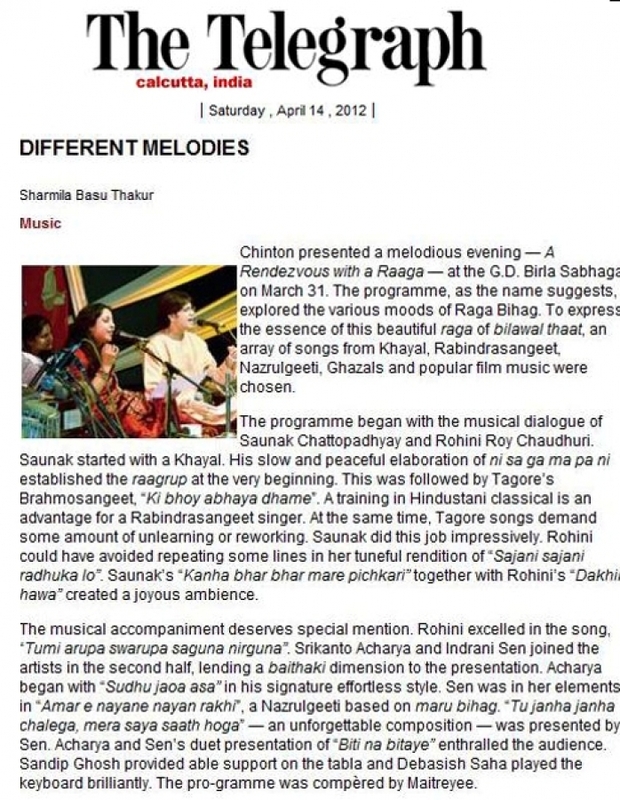 "A Rendezvous with A Raga” (2012) was a complete departure. 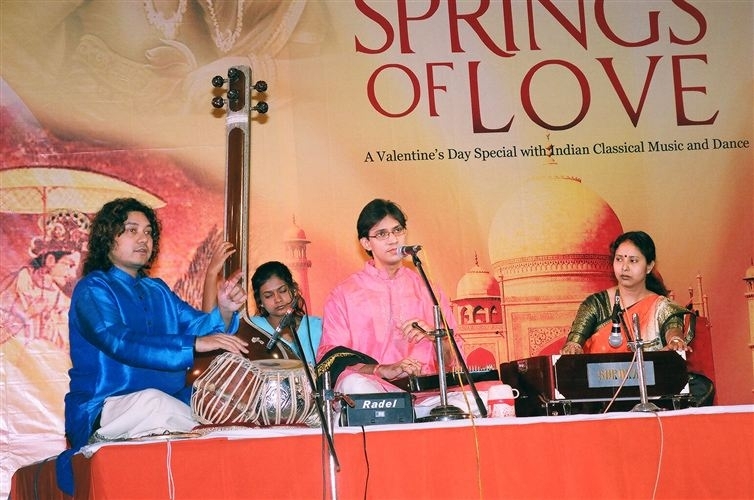 Unlike the previous years, this time the celebration was not Valentine’s Day, but music itself. 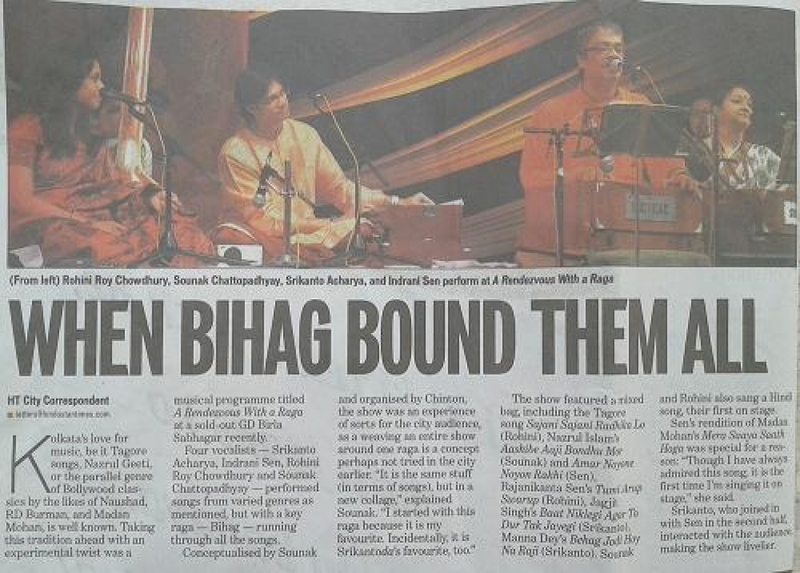 Sounak teamed up with the young and talented Rohini Raychaudhury and the stalwarts Srikanto Acharya and Indrani Sen on March 31st, to put up a most memorable evening of sheer music and melody at the G D Birla Sabhagar in Kolkata. 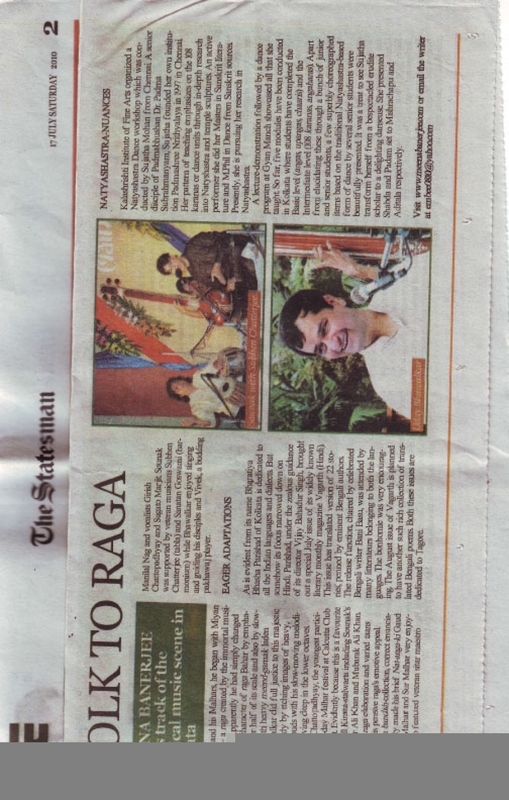 Raga Bihag was the protagonist of the evening and the artists showcased the Raga in all its dimentions. 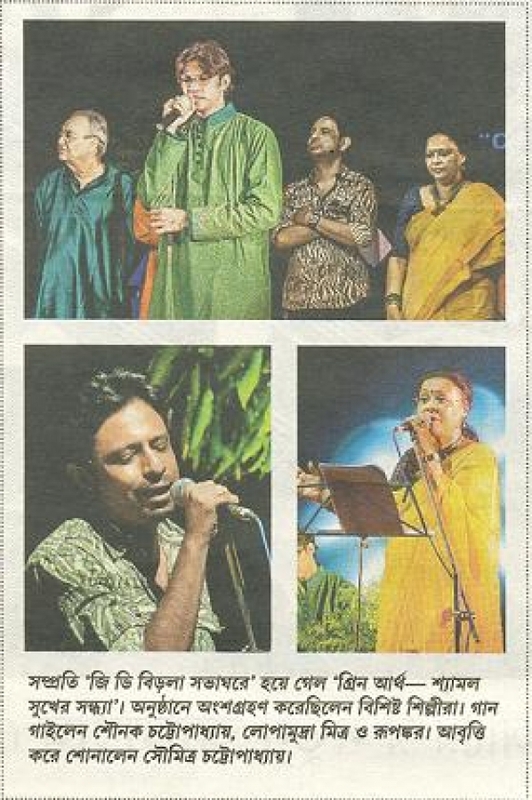 From khayal to Raagpradhan, Rabindrasangeet to Nazrulgeeti and Atulprasadi and even retro classics from R D Burman and Madan Mohan were performed. 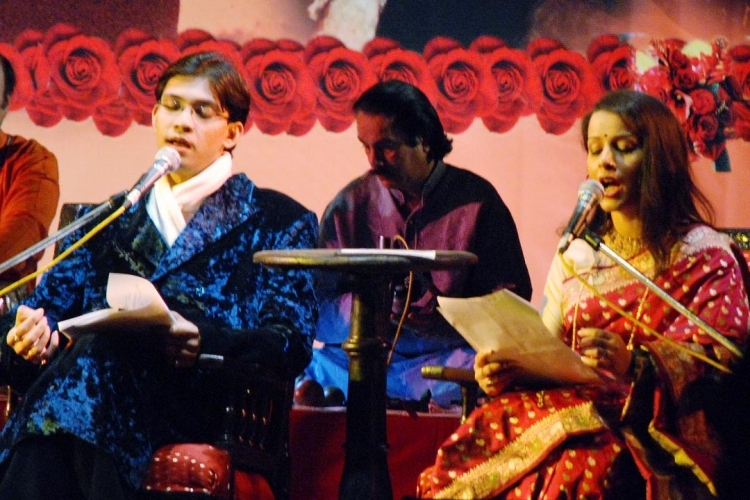 “Premer Haate Dhora Debo” (2011) -This was Chintons third Valentine's Day production. This year the love day celebration was more sober and traditionally designed. 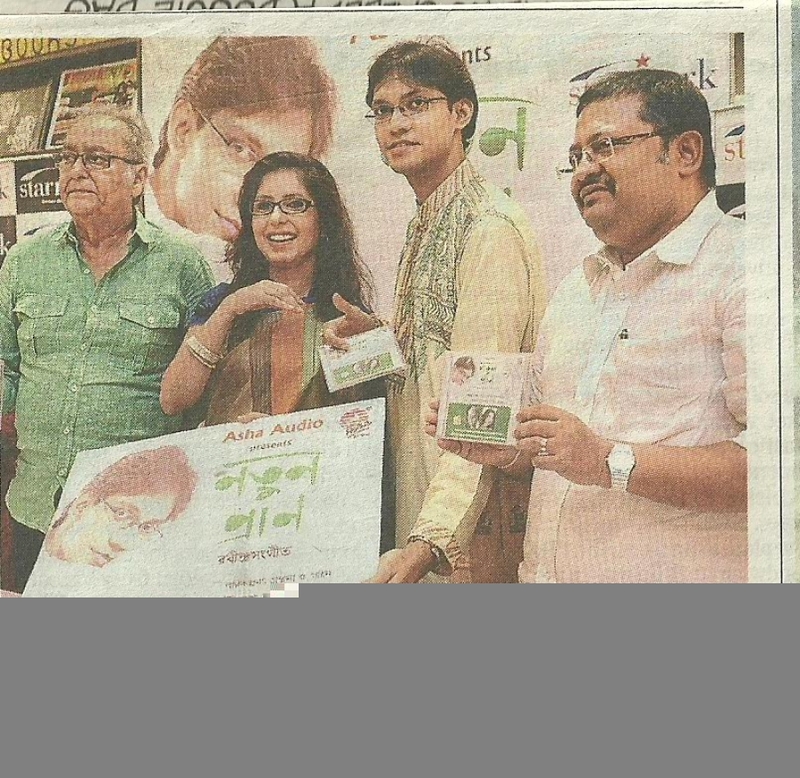 Bengali with ace singer Jayati Chakraborty teaming with Sounak to render romantic melodies from Rabindranath and his contemporaries. 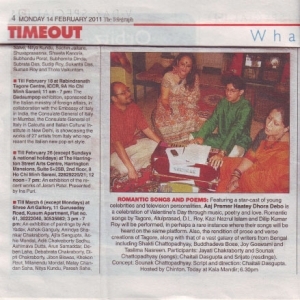 Chaitali Dasgupta and star poet Srijato participated as elocutionists. 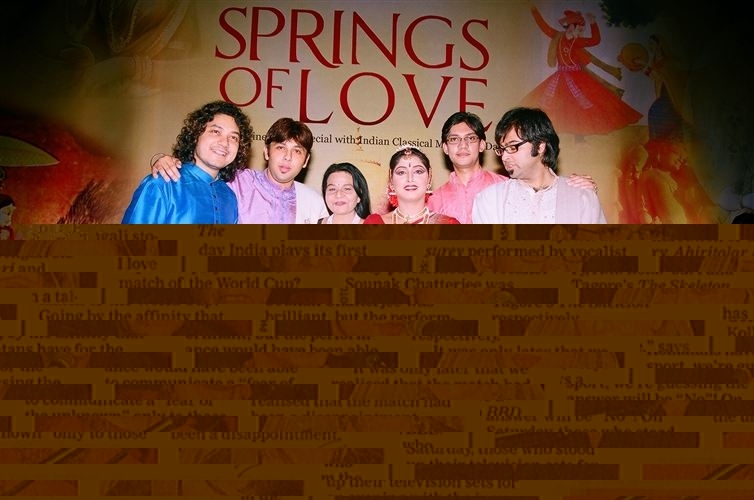 “Springs of Love” (2010) - The 2nd year saw Chinton exploring the Ragas and bandishes in a Valentine’s Day fiesta. 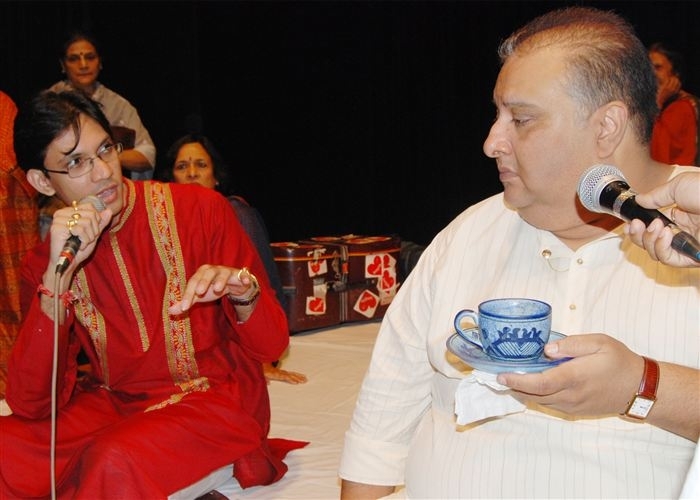 In 2010 maestro and star sitarist Purbayan Chatterjee joined danseuse Jaya Seal Ghosh and Sounak in a performance to eulogize love with traditional and classical Indian tunes. 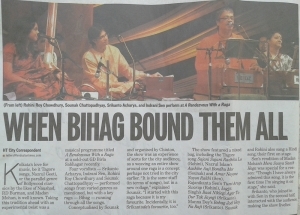 Anubrata Chatterjee and Subhajyoti Guha accompoanied the artists on the tabla and Rupashree Bhattacharya on the Harmonium. Smt. 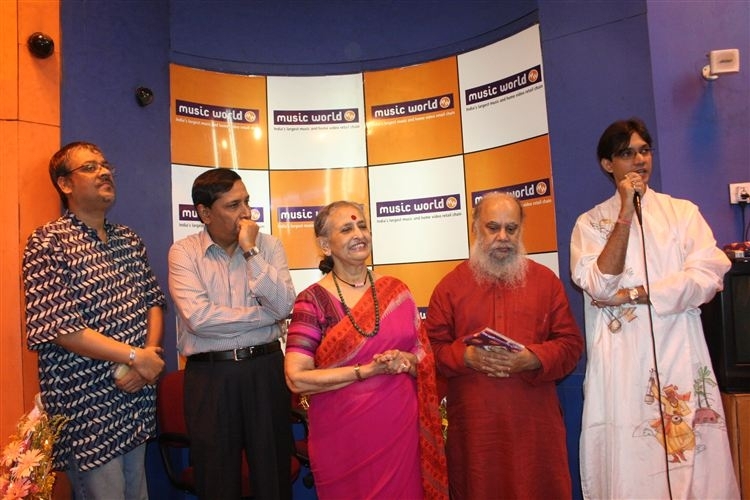 Veena Kichlu read out poetry in Hindi from ancient texts. 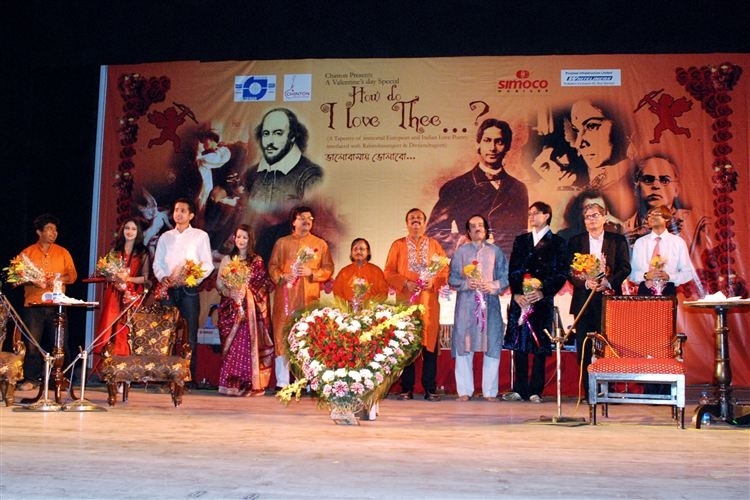 “How Do I Love Thee” (2009) Litterateur Sankarlal Bhattacharjee’s script united everlasting romantic compositions in music and poetry, from Shakespeare to Baudelaire; from Rabindranath to Joy Goswami, in an evening of gaiety and celebration. 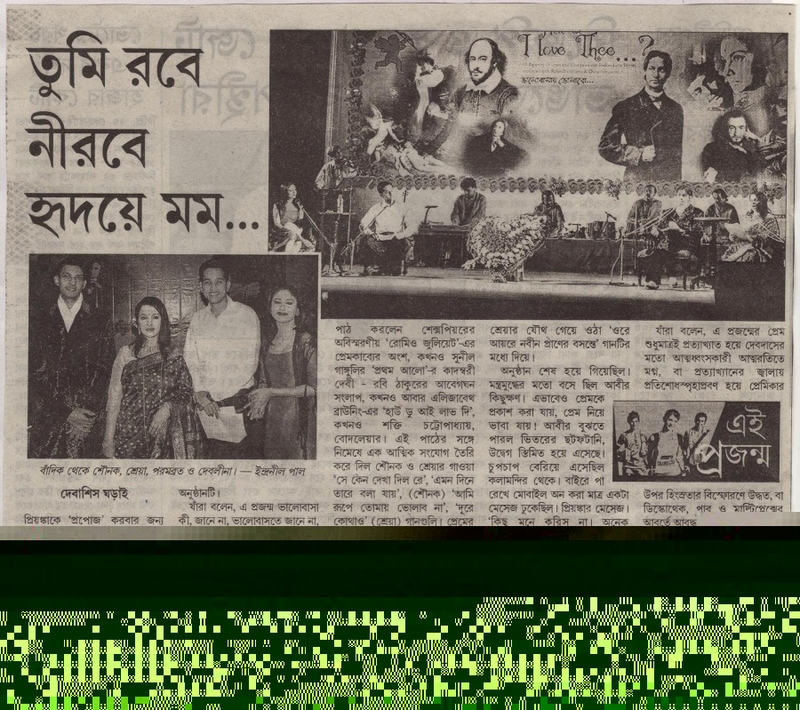 Film stars Parambrata Chatterjee and Debleena Dutta coupled with RJ Raja, Shreya Guhathakurta and Sounak to create music and magic that the audience remembered for a very long time. Chinton's first show had set a trend for celebrating Valentine's Day in a manner the city had never seen before. Comments: I am a fan of the classical music pieces you sing. 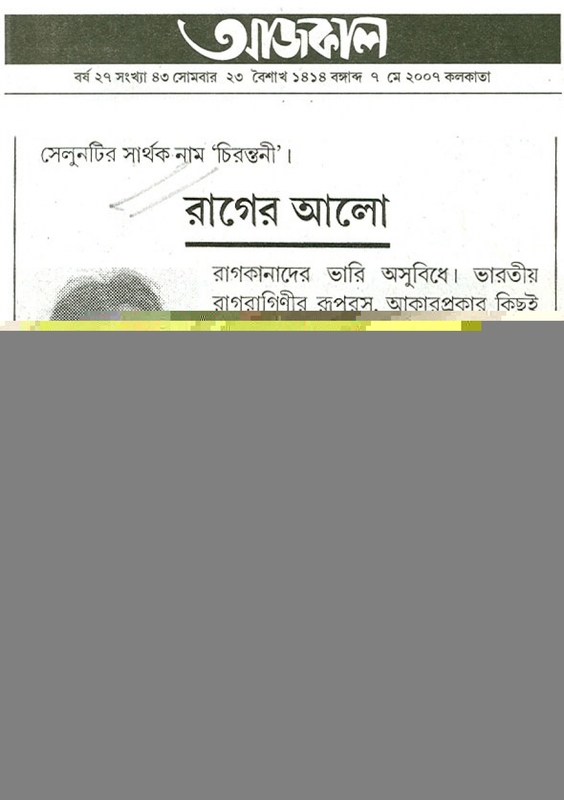 I would like to know the date of upcoming program in Kolkata. 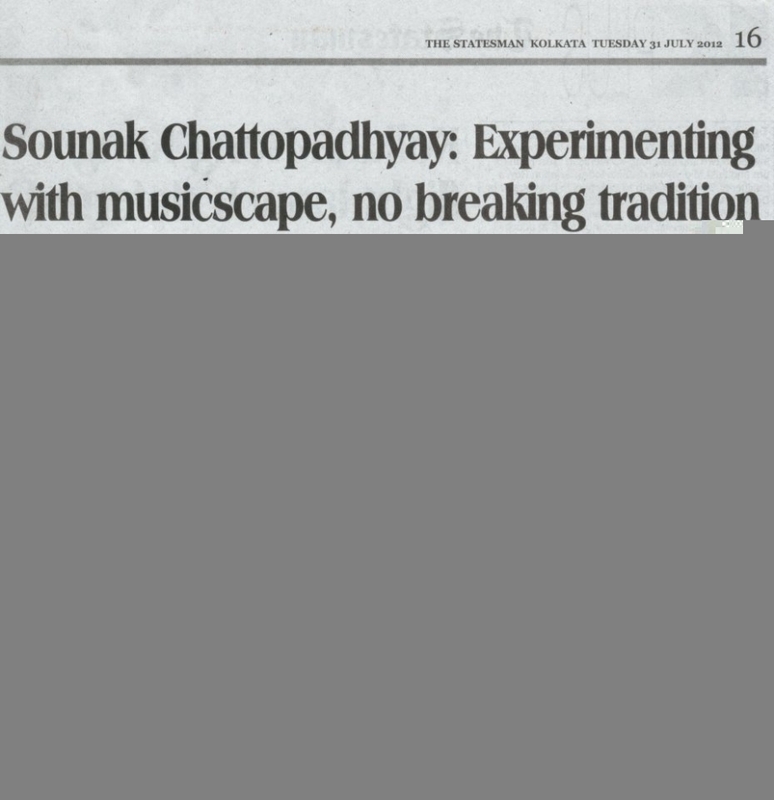 Comments: I recently heard Sounak's performance in Bay Area (USA). It was wonderful to say the least. Great voice. 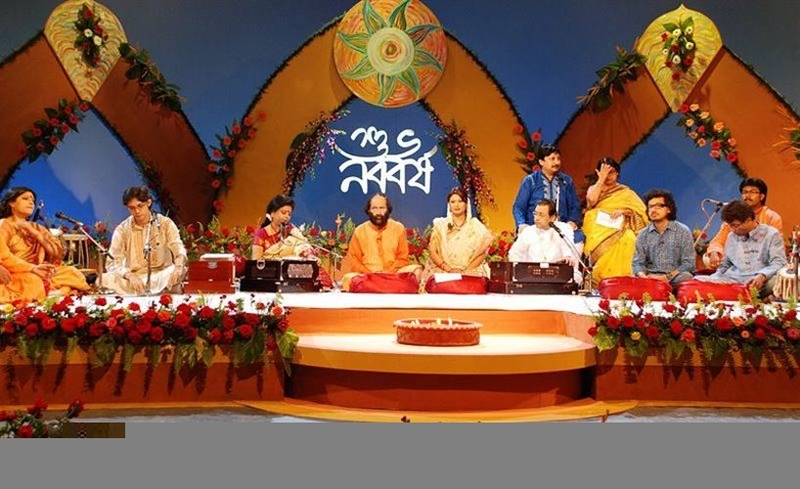 One suggestion though, it would be good to mix up the spiritual songs with some popular Rabindrasangeet or other kinds that are also spiritual but more known to general public. Wish Sounak national and international fame and success. Comments: I am a student of Bengal Engineering and Science university,Shibpur. I have watch your excellent jugolbondi performance. We are very much delighted. Thanks for giving us so much pleasure.